I seldom think of The New Yorker Magazine as the go-to place for theological reflection. Better-known for its subtle cartoons, its thoughtful essays, and the ads for luxury items I couldn’t possibly afford, I just don’t think of it as a purveyor of religious insight. Those familiar with one form of the penitential rite at the beginning of Mass can appreciate the pickle in which these two guys found themselves. In that opening rite of the liturgy we confess what we have done and what we have failed to do — the sins of commission and the sins of omission. And if such distinctions seem nit-picky to some people, consider this. They do in fact get to the heart of what it means to be a Christian. It’s an admission, first of all, that we do sin. We do wrong to one another; and sometimes it’s a matter of holding back when we should have acted. Who’s to say which is worse — doing the evil we do, or failing to do the good we are capable of doing. But both sins have something in common. Both testify that we are not people of integrity. Both say we are people who do not translate our fundamental belief into lived reality. From that perspective it doesn’t really matter whether we commit sins of omission or commission; because in both cases we are not who we say we are. In both cases we are destined to join that conversation in hell with the two convicted sinners. That bit of background may help in our appreciation of the parable that we’ve just heard from the gospel of St. Matthew. The story of the two sons is one of those classic conundrums that Jesus delighted in putting to people, and it’s a conundrum because each son exhibits some less than admirable as well as some noble qualities. The first son, when asked by the father to go and work in the vineyard, basically told his father to take a hike. He was not going to go. But he gave it some thought, and he went. So the son is guilty of disrespect and I suppose is also guilty of lying. He said he wouldn’t work and then he worked. But it was his considered response and action that ultimately win our sympathy. He’s a good guy after all. The second son, on the other hand, said all the right things. He respected his father and showed to all and sundry that he was obedient. But then his actions in fact told his father to take a hike. He had no intention of going to the vineyard. So just like his first audience, Jesus asks this of us. Which son is worthy and which one is not? And more precisely, in whose sandals do we find ourselves standing when push comes to shove? It’s not wrong to reduce this parable to a matter of obedience or disobedience, but there’s something deeper here. That becomes evident when Jesus launches into a comparison between the tax-collectors and prostitutes on the one hand, and the scribes and scholars of the law on the other. On a scale of uprightness, the religious experts win hands down. But this is not a matter of obedience or disobedience. This is all about hypocrisy. The tax-collectors and prostitutes are far worse when it comes to the gravity of their sins, while the upright people are guilty of little more than peccadillos. The tax-collectors and prostitutes make no bones about their sinful ways; but their repentance is authentic. They are sinners and they freely admit it. They are who they say they are. But they also know who they want to become. By contrast, the religious leaders need no such radical conversion. They’ve committed no grave sins; they’ve lived upright lives; they’ve done nothing blameworthy. Even so, they may have been obedient and upright, but to put a positive spin on it, Jesus hints that they have done little or nothing of value at all. They have nothing to show for their lives. They are not who they say they are, and for Jesus hypocrisy is the gravest sin of all. Jesus offers this parable for us to chew on for our own reflection. He’s not interested in beating us up or making us feel guilty about what we’ve done and what we continue to do. Nor does he delight in wringing out of us a confession of the good we failed to do when the chips were down. All that is secondary to the real issue he wants us to think about. Are we really who we say we are? Can people count on us to translate our beliefs into action? Or are we all talk and no action? Or as some like to say in Texas, are we all hat and no cattle? I don’t know about you, but at the end of the day I don’t want to be the guy in hell who has nothing of value to recall from a life lived on the sidelines. Of course Jesus doesn’t want us to go out and commit a bunch of sins so that we’ll have lots of good memories in hell. Rather, Jesus asks something far simpler than that. He asks that we strive to be who we say we are. He asks that we love God and love our neighbor and figure out how that translates into a life well-lived. And he reminds us that if we want memories of a life well-lived, the time to make those memories is today, not tomorrow. +On 25 September I took part in the annual meeting of the Friends of the Malta Study Center at the Hill Museum & Manuscript Library at Saint John’s. Among those in attendance were Mr. Bob Shafer, retired ambassador of the Order of Malta to the United Nations; Fra Tom Mulligan of Chicago and Fra Nicola Tegoni of New York. Mr. Joseph S. Micallef and Steven Kennedy, both members of the Order of Malta, rounded out the contingent of members of Malta in attendance. +On 30 September I attended the football game with Bethel University, which Saint John’s hosted. The good guys won, 21-13. +On October 1st I presided at the Abbey Mass. I don’t know what a “typical Sunday” would be for me, but my day went something like this. I got up at 4 am and finished my sermon for the Mass. Then I attended morning prayer at 7 am. Presided at Mass at 10:30 am. Went to lunch with the community at noon. At lunch I happened to sit with Brother Isidore, who among other things described his competition with the squirrels to gather black walnuts on the abbey grounds. He shells and sells them in the abbey gift shop. This fall he has collected 250 pounds so far. The squirrels are not entirely happy, but there’s plenty for everyone. In the afternoon I got some exercise and then watched as Fr. Lew loaded honeycombs into the honey-extracting machine. I didn’t stay to watch, since it is pretty much like looking at the spin cycle on the washing machine. Then I presided at Sunday vespers, and at the end of that I threw my alb in the washing machine. The aroma of incense pervaded it, and I did not want that in my closet. After dinner I finished my blog and then went to bed. That’s one monk’s schedule on a Sunday. Not terribly glamourous, but a great day nonetheless. 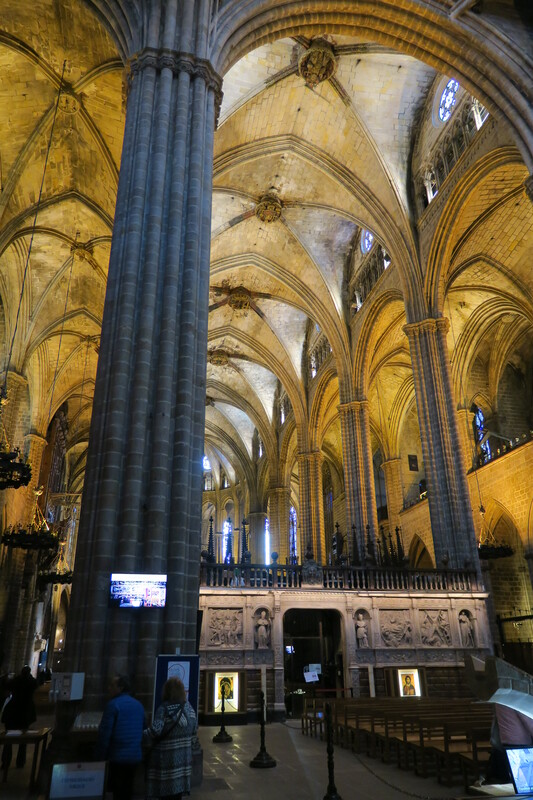 +Given the turmoil in Catalonia, I decided to adorn today’s post with photos I took of the medieval cathedral in Barcelona. 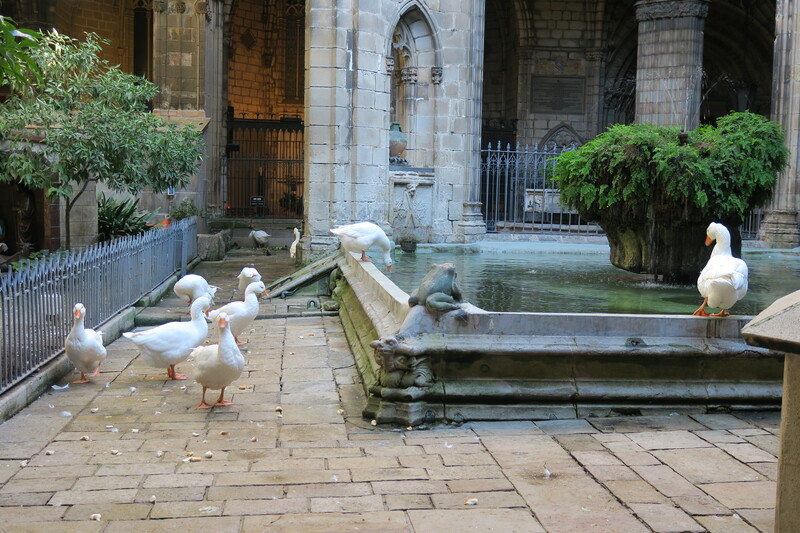 Barcelona was the port of entry on my very first visit to Spain, when I went to do dissertation research. I’ve loved the place ever since and feel not a little distressed by the current situation there. There you have it — just the sort of thing that would make a six-year-old scream that “it’s just not fair!” And in my own jaded reading, I’m tempted to agree. This verse suggests that Jesus too believed that life was unfair. Worse still, if this is what Jesus really believed, then it puts the lie to the Beatitudes, where Jesus offered at least some shred of hope to those who have so little. So what exactly is Jesus trying to do here? Does he mean to drive the poor into despair, while the rich cry all the way to the bank? An appreciation of this passage depends a lot on whether you take a materialistic approach to its interpretation. Thankfully, most experts believe that Jesus was speaking about neither capitalism nor matters of social justice. Rather, he was talking about the spirit in which people approach life. If they are generous with their gifts and talents, then they very likely will discover a personal capacity that they had scarcely imagined about themselves. Conversely, those who are afraid to test the limits of their gifts and talents run the risk of having little or nothing to show for their lives. That’s how I developed the sermon, and I concluded with this note. Life is filled with risk, but perhaps the biggest risk is to give without any assurance that our efforts will make a bit of difference to anyone. That’s the most challenging thing in the world to do, and I think that’s what Jesus had in mind when he offered this bit of wisdom. At the end of Mass one woman came up to thank me for my thoughts. She and her husband had recently completed ten years of service in a project that had demanded a great deal of time and energy. Appearances to the contrary, it had required not a little grit as they butted up against a culture that ran counter to what inspired them. Had any of their efforts mattered? Had they accomplished anything in the course of ten years? Would their contribution of time and talent evaporate the minute they left the property? These issues confront us all, and not just those who commit themselves to some major charitable projects. Parents realize this instinctively as they raise their children. Who knows what kids will turn out to be when they grow up? What teachers don’t worry about what will become of the students sitting in front of them? What mentors don’t wonder whether their efforts will make any sort of difference? These anxieties trouble all of us, and we wonder whether we should have bothered to do anything in the first place. Worse still, the instances when our efforts accomplished little or nothing sow further doubts. Should we ever risk anything again? These questions now haunted this woman and her husband, and they had become almost depressed about the whole thing. But my words had suggested a way out of their emotional conundrum. I’d not fashioned my sermon to deal with such practical experiences, but this woman made real to me the challenges that all of us face in the course of life. How many times do we have the chance to give of ourselves and yet shrink back because we’re not sure of the results? What if people take advantage of our generosity? What if people remain unchanged, and our efforts go for naught? These questions confront all thoughtful people as they risk stepping out of their comfort zone for the sake of others. These are the moments when we need to recall to mind the suddenly sensible words of Jesus. Self-giving can never be reduced to a contractual relationship with the people we help. Service can never involve a quid pro quo in which we demand specific results from our kids or our students or anybody else whom we help. All we really have a right to ask is that someday these people will make the right choices in life, just as we’ve been given that same chance. Two things strike me as good takeaways from all of this. First of all, giving of ourselves makes the world a better place. That’s true whether our efforts yield no results at all or spectacular results. If we don’t risk ourselves, then we can rest assured that nothing will ever happen. If we do risk something, then there’s at least some chance of a good outcome, even if it isn’t exactly what we had in mind. Second, in Luke 8 Jesus did not promise that our efforts would transform the world. He promised nothing of the sort. All Jesus promised was that our efforts would transform us. That, after all, is both the cost and the reward of discipleship. +On September 26th I attended the annual meeting of the Friends of the Malta Center at the Hill Museum & Manuscript Library at Saint John’s University. 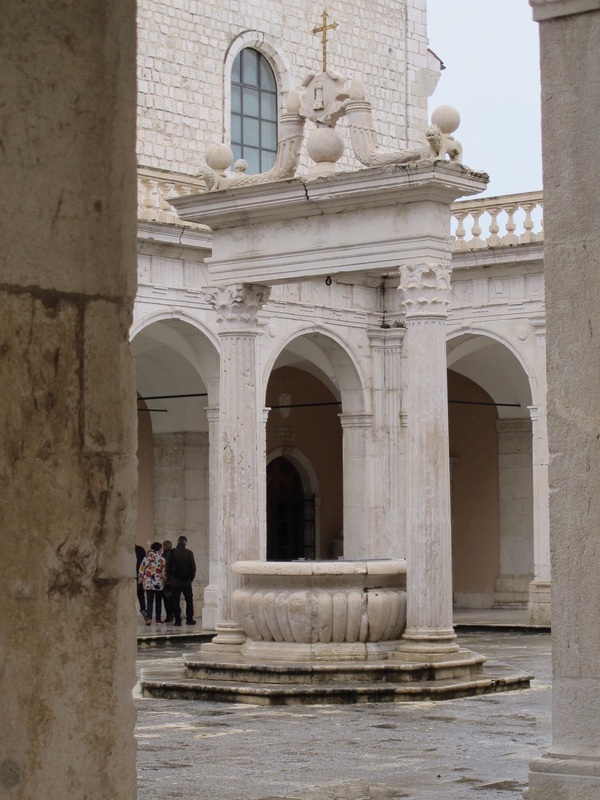 The Center has been involved in the preservation of documents relating to the history of the Order of Malta, and today HMML has more of such material than any repository outside of Malta. The Center has been involved in this work for 40+ years and continues to digitize various collections as well as build its own collections of resources. Among other topics, we discussed current work of the Center at the Cathedral library and museum in Mdina, on the island of Malta. 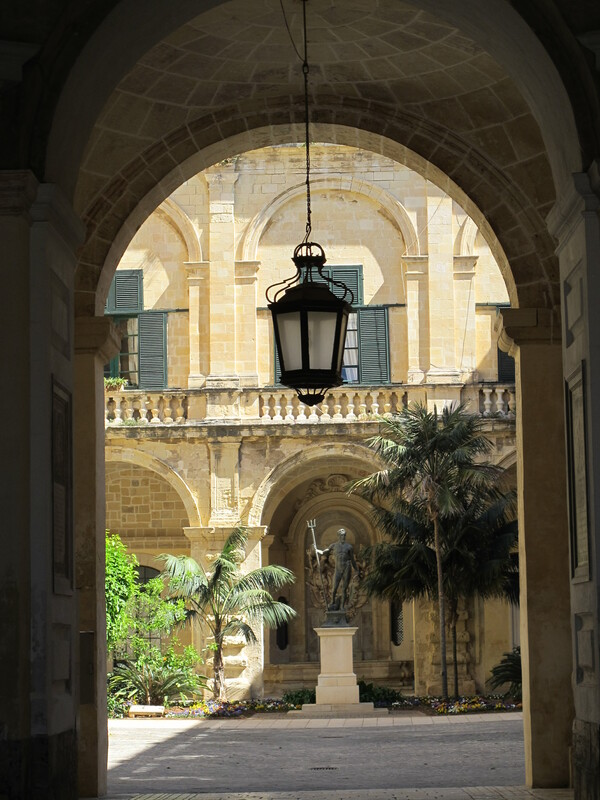 Since the middle ages Mdina has been the seat of the archbishops of Malta. It was the medieval capital of Malta, and was only eclipsed with the construction of the Knights’ capital of Valletta in the 17th century. 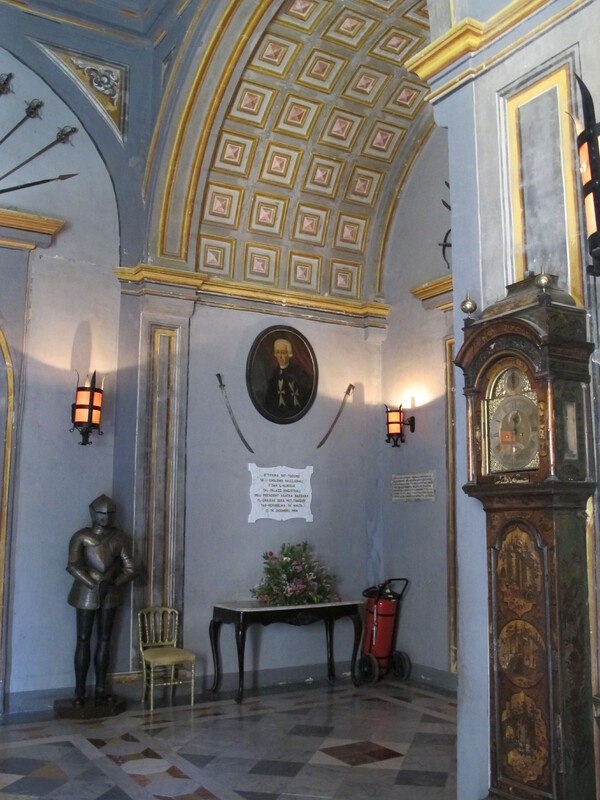 The city and cathedral in Mdina have a wonderful charm, as this gallery link suggests. +On September 29th I gave three talks on The Saint John’s Bible at Xavier University in Cincinnati. I had a delightful time, not least because I got to page through one of my favorite books, The Nuremberg Chronicles, printed in the late 15th century. It is housed in the special collections department in the University library. +This last weekend in Minnesota it was absolutely stunning weather-wise, and I enjoyed daily walks around campus. 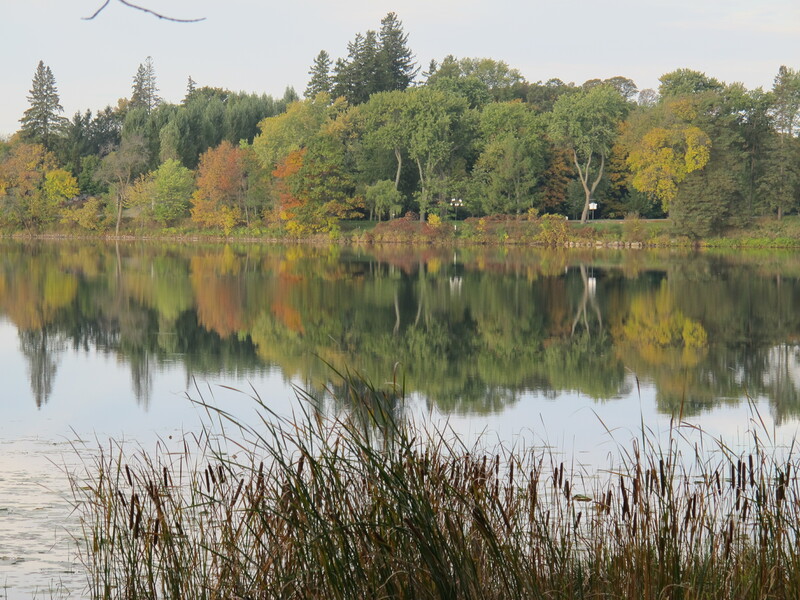 As the enclosed photos illustrate the autumn colors have been slow to arrive. 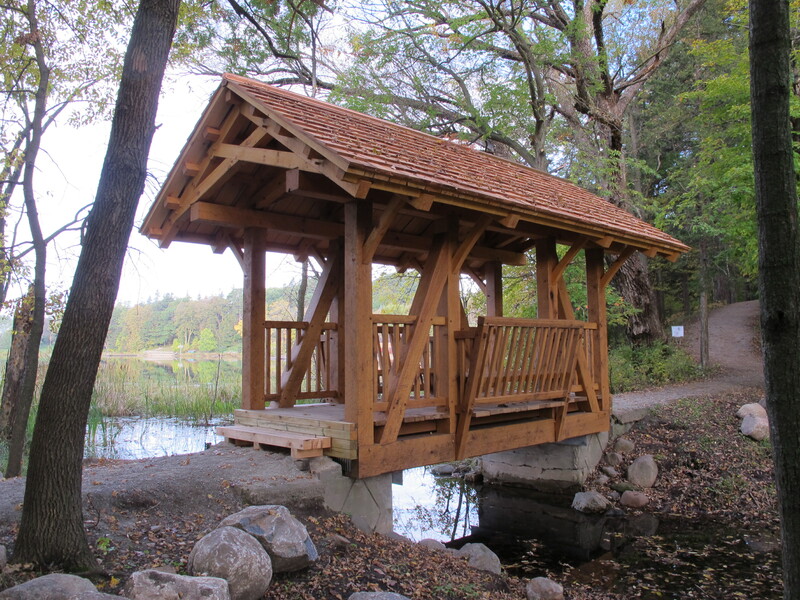 Included among the photos is one of the new footbridge, which was blessed by Abbot John last week. 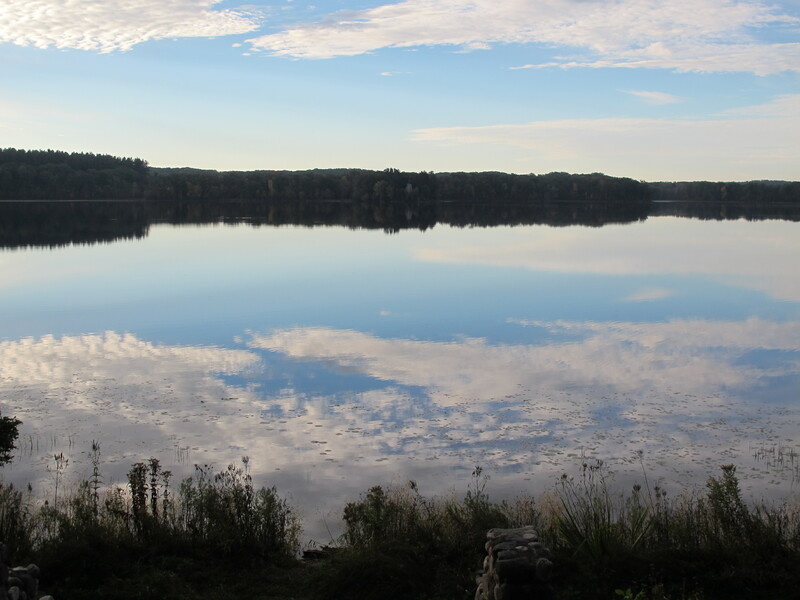 It was also a great weekend to contemplate the beauty of Lake Sagatagan, over which the Abbey looks. My first trip to the island of Malta was a real eye-opener. I’d been director of the Hill Museum & Manuscript Library (HMML) at Saint John’s University for only a few months, and I had to get up to speed on the various projects on HMML’s plate. 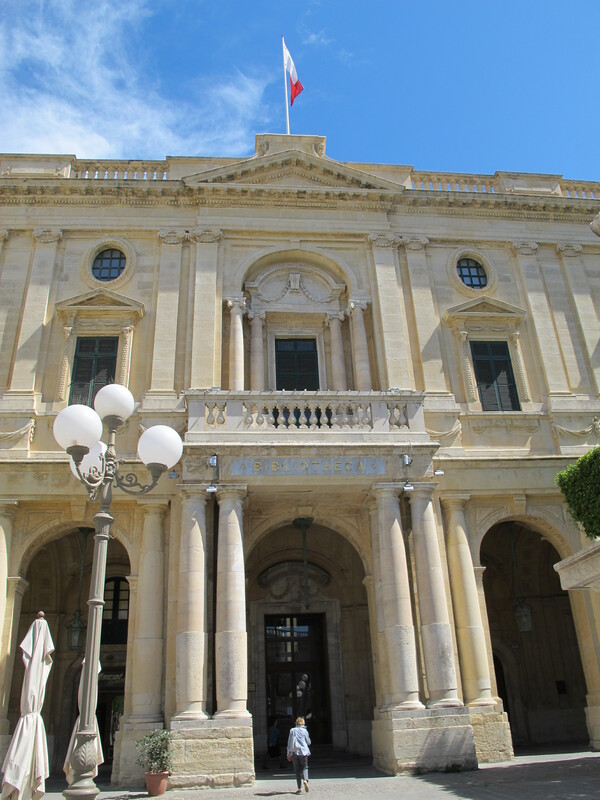 So I flew to Valletta to visit the National Library, where HMML had assisted in photographing the archives of the Order of Malta. Since I’d been to other islands already, I assumed that this one would be like all the rest, save for the library. I was completely wrong about that. Physically, Malta is not very big, and from its medieval capital of Medina you can see the whole thing spread out around you. And it’s crowded — really crowded. There’s also a lot of stone there. From stately buildings to the simplest homes, the tan-colored stone gives it the feel of the Middle East. And the landscape is so strewn with stones that you quickly understand why the Maltese have to import most of their food. In fact they import nearly everything, except for capers. Those bushes grow everywhere, like weeds, and they’d take over if people didn’t chop them back. The latter seems a shame, because I love capers. For what Malta lacks in vegetation it more than compensates with its history. In fact it wears the past on its sleeve, and everywhere you turn it tells a larger-than-life story. Its neolithic temples are among the most ancient structures on the planet, and traces of a succession of foreign rulers show up all over the place. The fact that outsiders like Romans, Arabs, French and English occupied the place continuously for 2,000 years means that Maltese self-government is a very recent experiment. Undeniably it is the Order of Saint John that has left the greatest mark on the island. Now known as the Order of Malta, it began in Jerusalem as a hospice serving sick and poor pilgrims, run by the monks of a Benedictine abbey. 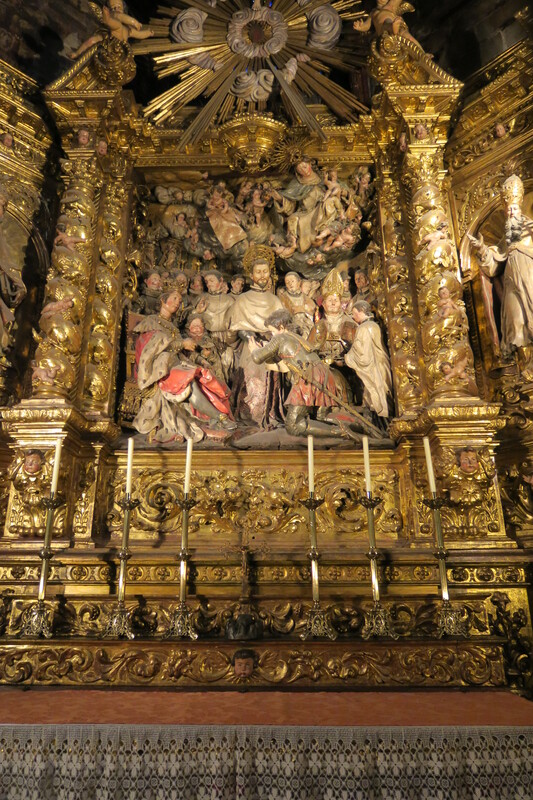 From Pope Pascal II in 1113 Blessed Frá Gerard received a charter that brought formal recognition as a religous order, and in Jerusalem it served Christians, Muslims and Jews. Later, after the Order’s expulsion from the Holy Land, the knights ended up on the island of Rhodes. There they stayed until 1523, and in 1530 they settled on Malta, where they remained until Napoleon dislodged them in 1798. 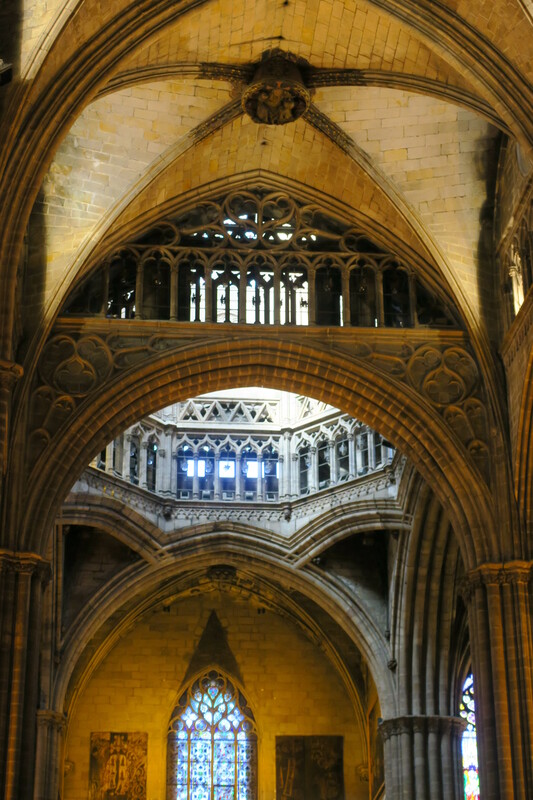 As an influential and accomplished group in the Middle Ages, the Knights of Saint John earned both admirers and enemies, as did their peers in the Order of the Temple. But they fared better than did the Templars and were never suppressed, though they came perilously close to extinction in the early 19th century. Along the way there were days when members must have wondered why they’d ever signed up for such a life. One such occasion was the siege of Rhodes in 1480, when the Ottoman Turks came close to dislodging them. The Turks finally did succeed in 1523, but as a gesture of respect the sultan gave the knights honorable passage off the island and into exile. The sultan’s successors came to regret that decision, and in 1565 the Turks sailed to Malta to rid the Mediterranean of the knights once and for all. What followed was one of the nastiest sieges ever, and I’ve always been surprised that Hollywood has never made a movie about it. It would be a blockbuster, with violence and bravery scarcely imaginable. But the knights held out against huge odds, until on September 8 the Turks lifted the siege and sailed away. The knights learned several things during that siege, and among them was the disadvantage of defending lower ground in an artillery duel. The Turks had commanded the high ground, and after the siege the knights hastily moved their capital to those heights. 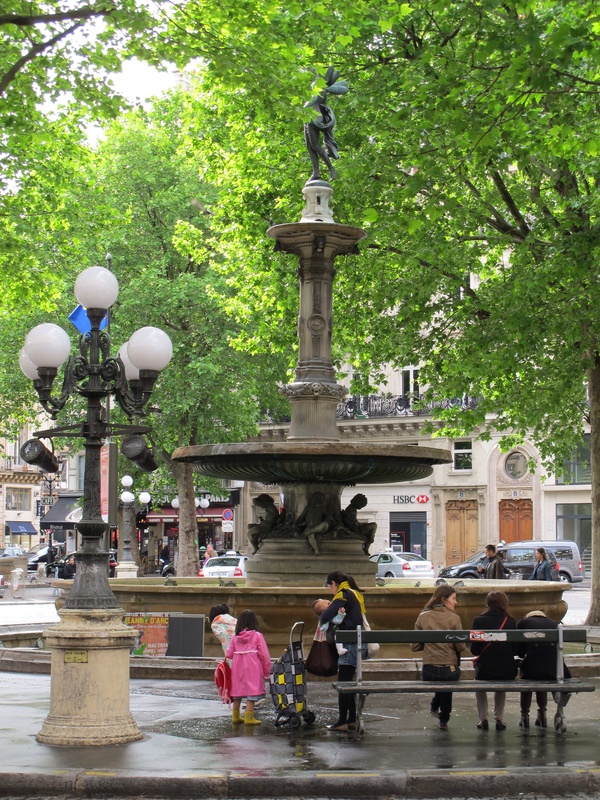 And they named the city after Grand Master Jean de la Valette, who had led them through the crisis. 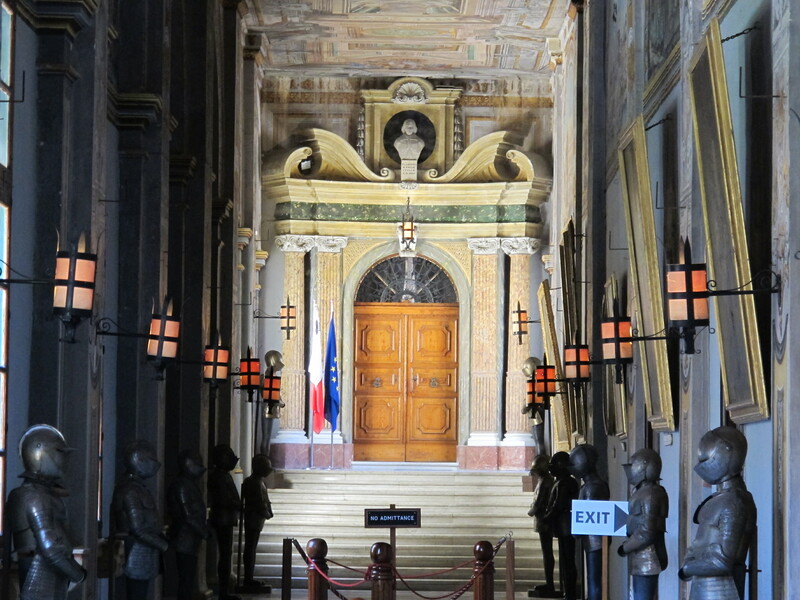 Today Valletta’s stately government buildings are the visible record of the knights’ 268 years of residence in Malta. On September 8th the Order of Malta celebrates the 450th anniversary of the lifting of the siege. Both Maltese citizens and members of the Order will gather in Valletta to mark the occasion and to celebrate what has happened since. After all those centuries the Maltese at last rule themselves, and the knights and dames of Malta have rededicated themselves to their original charism of service to the sick and the poor. The festivities in Malta will remind them of that latter commitment when they tour the vast 16th-century hospital in Valletta. 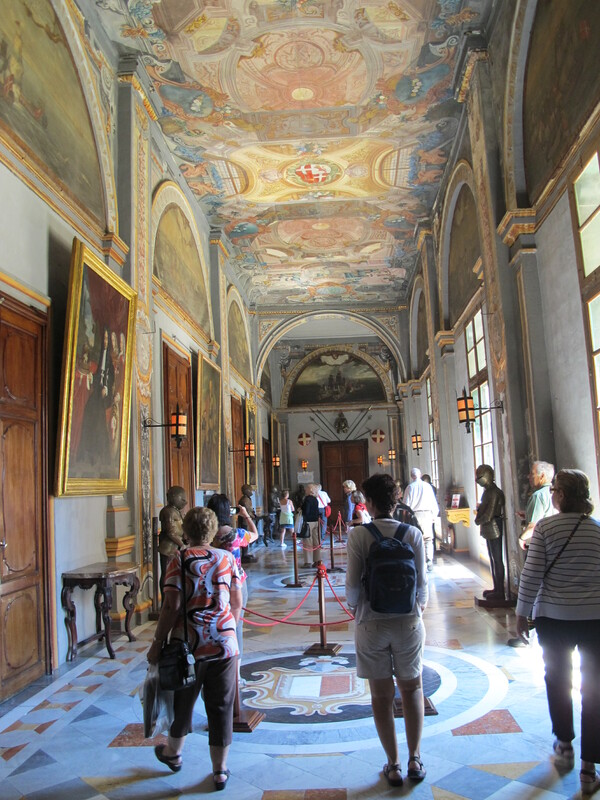 Meanwhile, at HMML the work of the Malta Study Center continues, as does its efforts in various archives in Malta and more recently at the Grand Magistry in Rome. 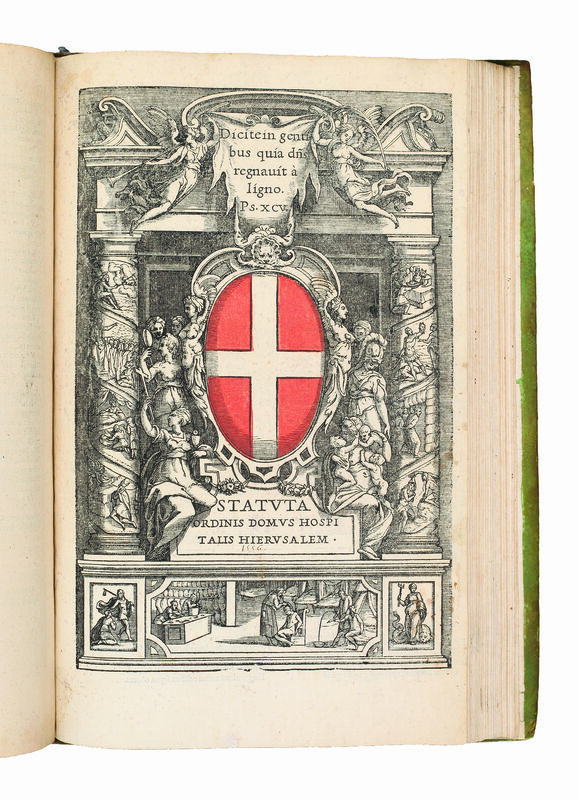 This week HMML marks the event with the opening of an exhibit of books and documents on the history of the Order of Malta, as well as a lecture on the siege by Dr. Emanuel Buttigieg of the University of Malta. Since my first visit to Malta I’ve had the chance to lead several tours to the island, and to a person the place leaves each and every visitor in awe. Each invariably has the same reaction as I did when I first looked down from the bastions of Villetta to an aircraft carrier docked directly below. And for knights and dames who visit Malta, there’s a sense of respect for what their predecessors in the Order sacrificed. Thankfully we no longer serve on the battlefield or on the seas, because at our age and physical condition we wouldn’t last ten minutes. But we can be grateful for what others did to keep the ideal of service alive. Those who sacrificed their lives in 1565 ensured that later generations in the Order would continue their care of the sick and the poor. Thankfully the siege did not mean the end of the history of the Order; rather, it was the opening of several new chapters. To all this I must append a footnote. Some people find history boring and tedious, but at the end of my first trip to Malta I learned how important it is to remember the lessons of history. As we drove our rental car onto the highway to return to the airport, the three of us were chatting away as we breezed down the road. Suddenly one of our number pointed out one great legacy of the English occupation. Had it been Minneapolis, driving on the right side of the road would have been just fine. But this was Malta, and just as in England they drive on the left side of the road. There we were, tooling merrily down the wrong side of a divided highway. We all shreiked and sweat bullets, and I thought of Saint Benedict’s advice to “keep death daily before our eyes.” That morning history was no longer an academic exercise. 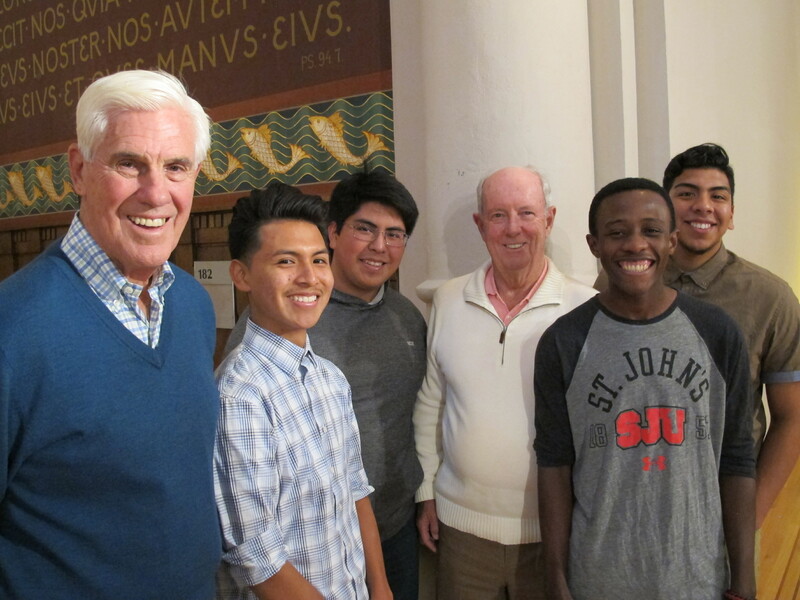 +On August 28th the freshmen at Saint John’s University joined the monks for vespers. And as is the custom of many years, they broke into small groups afterwards in order to “meet a monk” and learn about our life in the monastery. +On September 1st I presided at the burial service of Mary Foley, wife of Saint John’s University alumnus Dr. Bob Foley. The burial took place in the abbey cemetery. +On September 3rd I presided at the abbey Mass at Saint John’s. You can access the sermon through this link to The Lord’s Demands on Us. 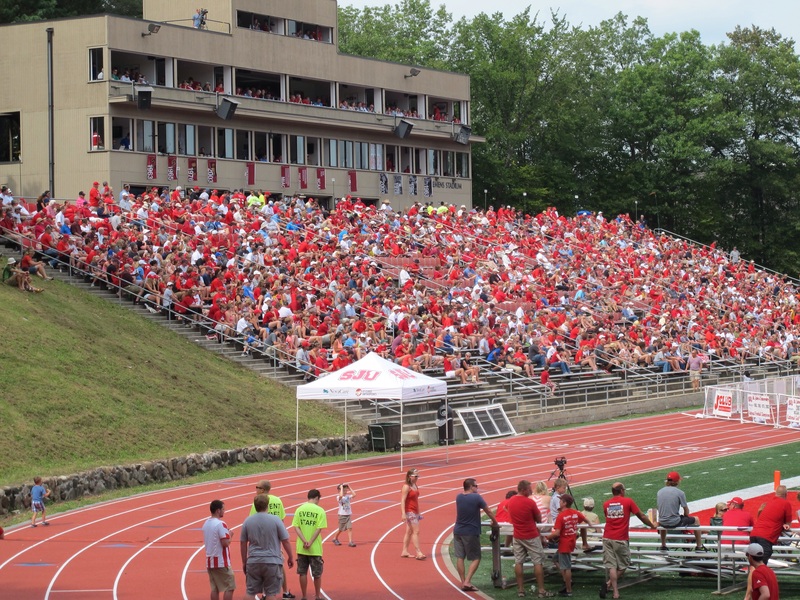 +On September 5th I attended the opening game of the Saint John’s University football season. 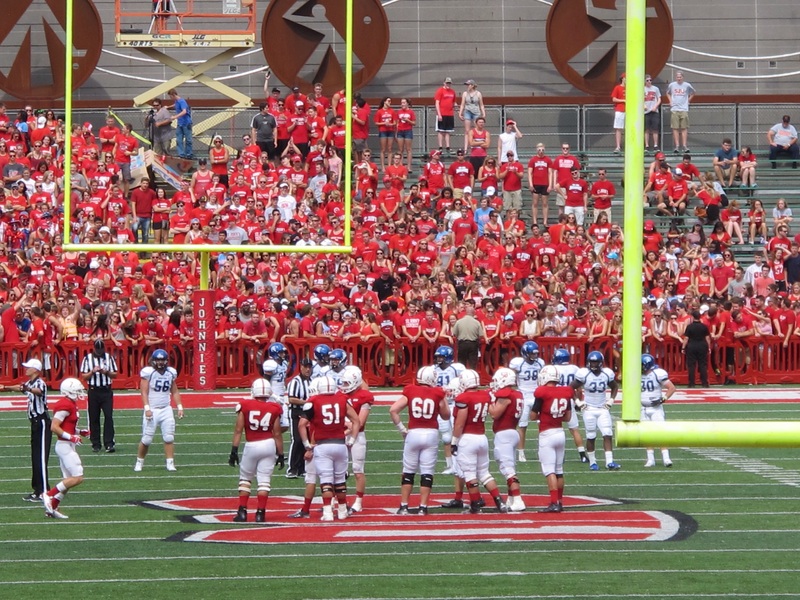 We hosted the University of Dubuque, and happily our team won the game rather handily, 45-9. +Dr. 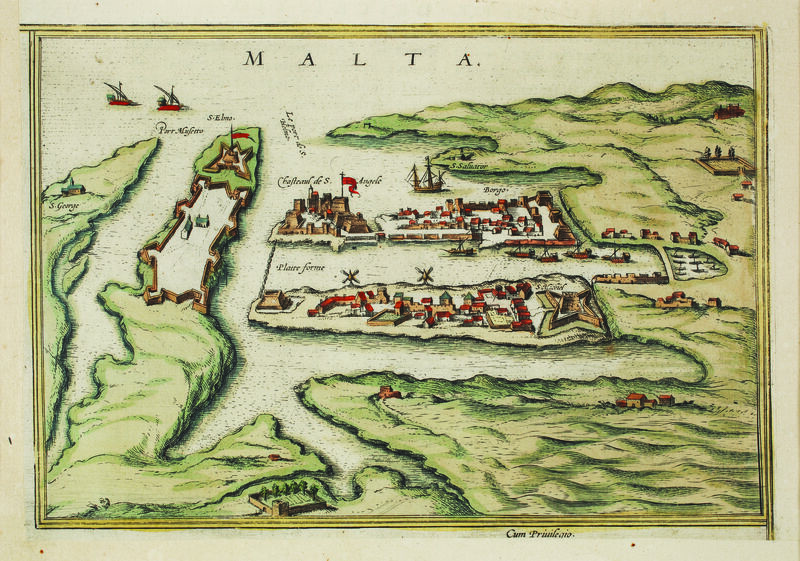 Daniel Gullo, the Joseph S. Micallef Curator of the Malta Study Center at HMML, kindly supplied five images from HMML’s current exhibit of books and documents illustrating the history of the Order of Malta. 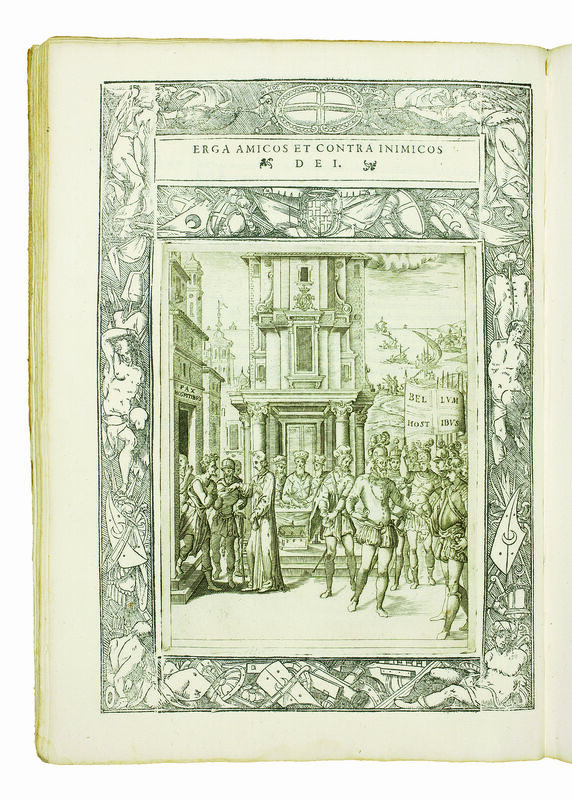 The first is a book of Statutes of the Order, printed in 1556. 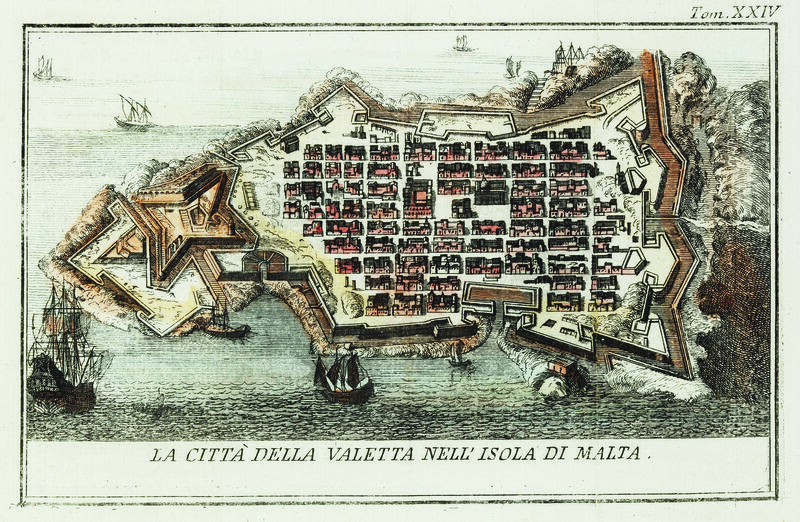 The second is a map of 1597, showing the harbor of Valletta, with the new city scarcely developed on the left of the map. In the map of 1762 you see the fully-developed city, built on a modern grid pattern. 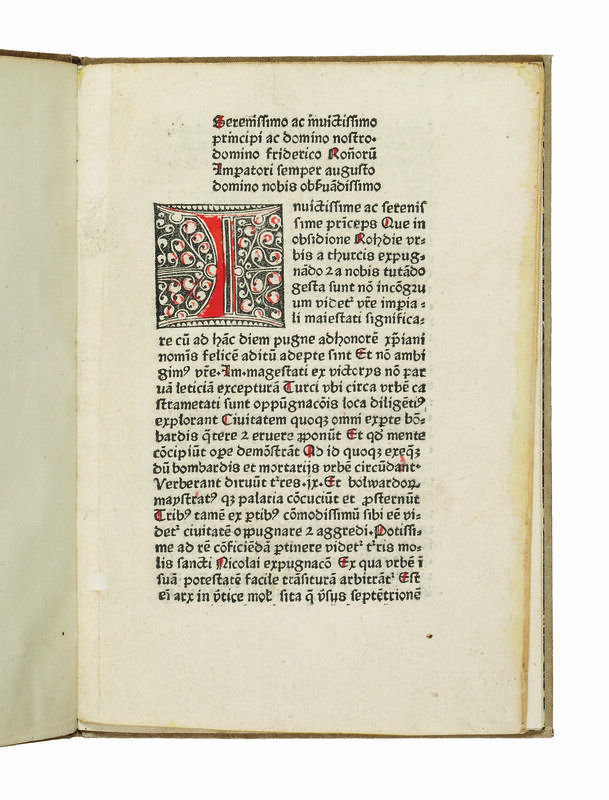 The fourth page opens the 1480 edition of Pierre D’Aubusson’s narrative of the siege of Rhodes; while the fifth image is taken from the Statutes, printed in 1588. All are in the collection of the Hill Museum & Manuscript Library at Saint John’s University. In a separate gallery I have presented some of my favorite photos, illustrating the architecture of the Island of Malta. I came way too late to the monastery to experience those first heady days of ecumenical encounter in central Minnesota. To be clear, I’m not writing about the dialogs among Catholics and Lutherans and Episcopalians. Those talks came much later, and they were possible only because of the earlier breakthrough between the German Catholics and the Polish Catholics. It’s hard to imagine the day when a mixed marriage in Stearns County, our county, was the term for a union between members of those two communities, and people spoke of such marriages in whispered tones. Given that disquiet about Catholics of non-German extraction, you can just imagine the level of enthusiasm that our early monks brought to the triad of feast days that sit squarely in the middle of Lent. On March 17th, the feast of Saint Patrick, the more daring of the monks admitted to trace elements of Celtic blood flowing in their veins; while the more cautious among them owned to having met someone of Irish heritage, once. Then, on the 19th, came the feast of Saint Joseph. Way back then there was little of anything Italian in our community, save for the decrees that came by boat from Rome. 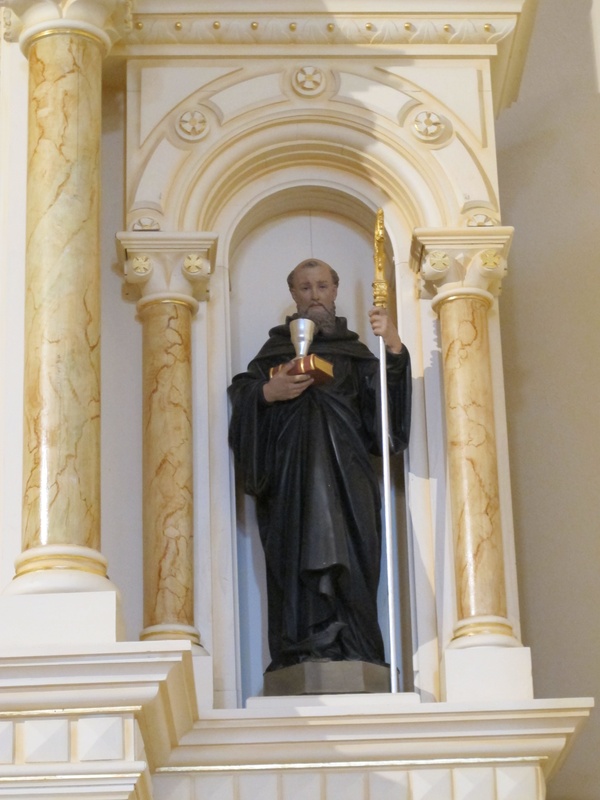 Then, in the next breath, the monks celebrated the feast of Saint Benedict on the 21st. Now that was a feast they could sink their teeth into, despite the glaring note of his accidental birth in Italy. In fact, he may have been born Italian, but there was something wonderfully German about the man that more than compensated. Our community, since day one, has had a strong work ethic. This turned out to be a strategic advantage in the pioneering days of Minnesota. In the days when the option for everybody who came here was hard work or freezing to death, our founding monks came well-disposed to make the right choice. And so a man like Benedict, whose motto was “work and pray,” had to have at least a little German in him, or so they must have thought. As for the Italian DNA in Saint Benedict, everyone knew it was there, though they must have hesitated about it. Here I’m not referring to the strain of legalism that has coursed through the Roman bureaucracy for centuries. Rather, I speak of the reputation for creativity that Italians have earned as they’ve applied the ideals of Christian doctrine to its lived expression. To say the least, I’ve always admired them for their genius at sorting out issues of law and love. But of course they are artists at heart. Nowhere is the tension between law and love better expressed than in the last visit that Benedict paid to his sister Scholastica. On the prescribed day they left their respective monasteries and met at some spot halfway in between. But as the visit stretched beyond Benedict’s self-imposed curfew, the latter grew antsy to get home. Scholastica was not so eager to call it a day, and she dismissed out of hand her brother’s insistence that his own Rule forbade an overnight absence from the monastery. That evening Scholastica got the better of her brother, and Benedict’s biographer, Pope Gregory the Great, did not hesitate to say so. “Surely it is no more than right that her influence was greater than his, since hers was the greater love.” So it was that the writer of the Rule lost out to his sister, and that day her great love trumped his excellent laws. The monastic tradition has delighted in these sorts of stories, partly because they owe so much to the spirit of the parables in the gospels. Common to them all is the suggestion that every now and then God really does raise up the lowly to confound the proud. They also warn that a healthy reserve of humility can come in handy, just when you need it most. And last but not least, they offer this one bit of wisdom: law has primacy, and the greatest of the laws is the command to love. Teasing this wisdom into everyday life is not easy, of course, but that’s what monks and nuns try to do. It’s also what thoughtful Christians do. All this is a little disconcerting for those who would like to put law and wisdom into opposite corners and dispense with one or the other. The fact is, we need a healthy balance of both. For its part, law is the practical embodiment of Christian ideals, and they lead us on the path to God. 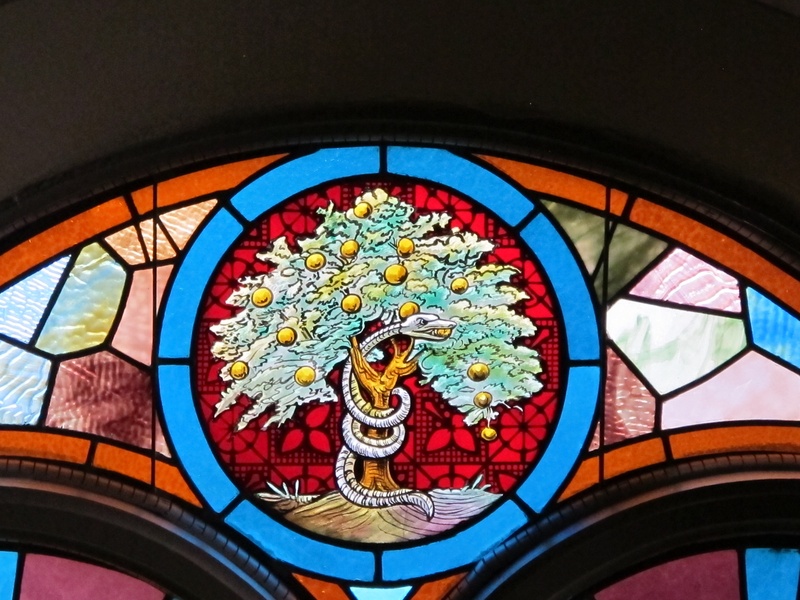 But the Holy Spirit grants us wisdom for those cases when we’re tempted to walk a straight line down a twisting road. Weaving the two together, it seems to me, is the challenge of Christian life. It’s also what makes it wonderfully beautiful. This March 21st I plan to celebrate the memory of the Benedict who wrote the Rule that still guides the lives of me and my brothers. But I also plan to celebrate the man who could look squarely at the command to love, and be wise enough to adjust his plans accordingly. +On March 15th I gave a conference to the Benedictine Oblates of Saint John’s Abbey, who had gathered for the Abbey Mass, lunch, and lectio. At the conclusion of the day, five individuals made their oblation, completing a year of study and prayer. +I neglected to mention in the last post that during our visit to Norcia, the city of Benedict’s birth, I was named a citizen of the town. To my great surprise I received a document signed by some civic official, suitable for framing. Only later did I have the presence of mind to ask our guide whether this entitled me to any special rights or privileges. “Do I qualify for a pension?” I asked. “Oh, I guess they forgot to tell you. We’re broke. Flat broke.” I’m now going back to read the fine print and find out whether I’m the first and only citizen of Norcia required by law to pay taxes. +I’m reaching back a bit to mention that on February 26th I attended a lecture at the Hill Museum & Manuscript Library at Saint John’s University, entitled Templars, Hospitallers and 12-century Popes. The Malta Study Center at HMML sponsored the talk, delivered by Dr. Jochen Burgtorf. Dr. Burgtorf is Professor of Medieval History at California State University at Fullerton. 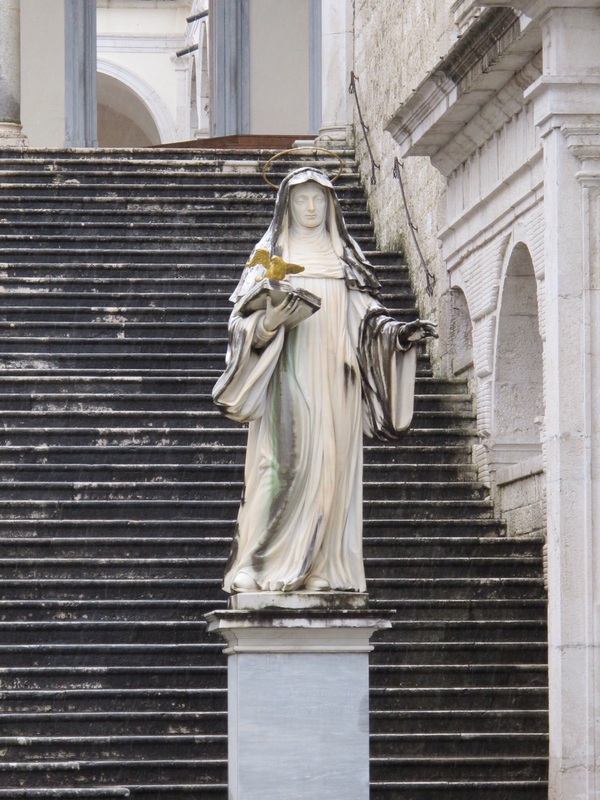 +The photos in today’s post all come from Monte Cassino. 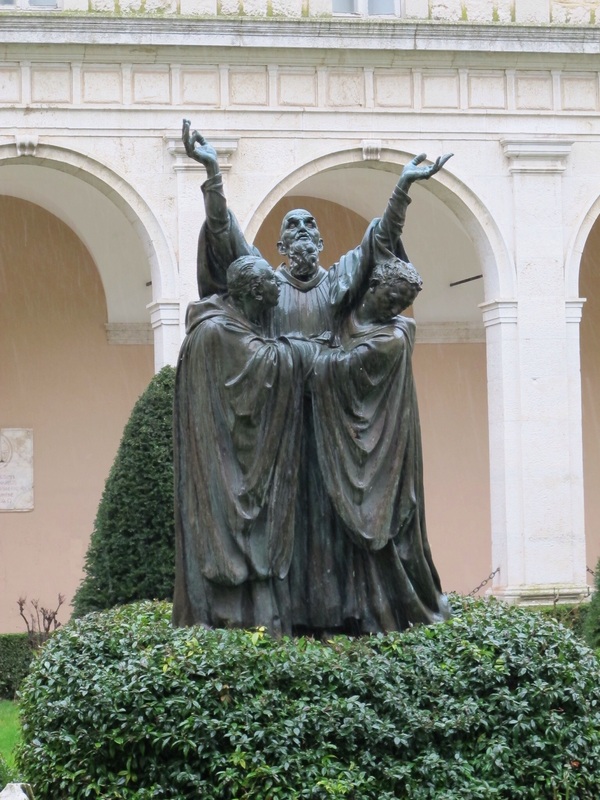 At top is a wonderful modern sculpture, depicting two monks who support Saint Benedict as he surrenders himself to God. Saint Benedict tells his monks that they are not to discuss with fellow monks what they’ve seen and heard on a journey. I’m not entirely sure why, but it serves as a good reason for why I’m not going to talk about two little episodes I had on a trip to Indianapolis last week. The first involved a connecting flight through Detroit. For those who flew through the old airport and vowed they’d never set foot in that terminal again, I’m happy to report that for a few years now it’s been safe to fly through Detroit. They must have sold the old terminal to a third-world country, or put it in a museum. Anyway, it’s long gone, and in its place stands a sight to behold. It’s shiny and sleek, and its main concourse is ideal for long-distance runners. But since I’ve seen that new terminal before, that’s not what caught my eye this time around. Rather, it was a magazine. Or to be more precise, it was two successive issues of a magazine. We’ve all seen those glossy magazines that toot the glories of every hamlet and burg across America, so it should come as no surprise that Detroit would have one too. However, it was not the magazine, but the lead story on the cover, that caught my eye as I sped along. 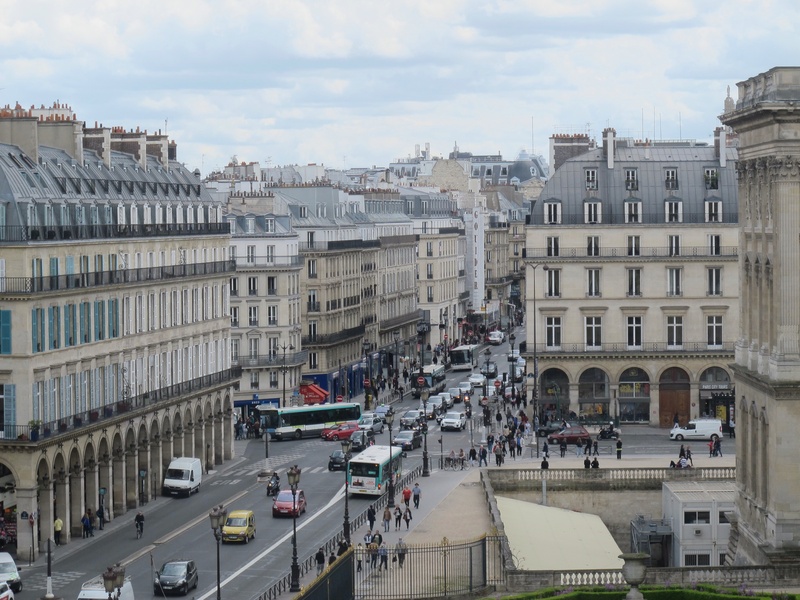 That issue had a headline that boldly compared Detroit to Paris. This came as a surprise to me, to say the least. I’ve been to both places, and up to now the resemblance had completely escaped me. They don’t even speak the same language, for heaven’s sake. But beyond that, evidently there’s a lot I’ve missed in my visits to those two cities, but I’m willing to give them both a second review. Maybe someone will point out what I failed to see the first time around. Three days later the return flight to Minneapolis also connected through Detroit. My number one goal this time was to find a copy of that magazine on Detroit and Paris. Without proof, my confreres would never believe my claim to have seen such a story. So I searched high and low, but alas, there was no trace of a copy to be found anywhere. Clearly, other equally stupefied travelers had snapped them all up, or the Chamber of Commerce had impounded them all, to avoid further embarrassment. All was not lost, however. In its place was a new issue that proclaimed Detroit to be the 9th most creative city in America. Actually, it could have been the 9th most creative city in the world, but I didn’t have time to read the fine print. And again I didn’t have the presence of mind to grab a copy. All that means that if I talk about this at home the abbot might conclude that I’m delirious and won’t let me off the property again. And at best, my confreres will tease me for reading back-issues of Mad Magazine or The Onion once again. The second notable experience took place in a rental car in Indianapolis. Before I got into this particular vehicle I used to think that our abbey cars were pretty modern. They all have roughly the same number of wheels, brakes, seats and a steering wheel on the left side. And they all operate pretty much the same way. But this car was unlike anything I’d sat in before. For one thing, it took me quite a while to start it. It’s not that I’ve not driven a push-button car before. It’s just that in this car I couldn’t figure out which button I dared to push. Finally I tried one, and nothing happened. Then the second one worked, and I felt a great sense of relief. How would it look to go back to the rental desk and ask how to start their car? I’ll tell you how it would look: not good. After that I spent quite a while figuring out how to turn on the radio. That done, it took another thirty miles on the road before I discovered how to change stations. It happened when my hand brushed against something and the music changed from country to rock. Desperately I retraced the movement of my hand to recall what I’d done to make this happen. I figured it out at last, and I then had the luxury of choosing among twenty-five country and rock stations. I never did find the classical or jazz, however. For all I know, despite all the techno-gadgetry, maybe this car didn’t play that kind of music. I never did learn how to adjust the side-view mirrors, but in true Minnesota fashion I decided they were just fine the way they were. Nor did I dare try and find out what a lot of those other buttons did. “Let sleeping dogs lie” is always a good motto to follow. But in all this I did have one personal triumph. All by myself I finally found the magic button that opens the flap to the gas tank. Given the lengths to which car-makers go to hide that thing, I should have gotten some sort of prize, like a free trip to Detroit, where I could practice my French and eat croissants. Anyway, for obvious reasons these are the kind of things you can’t talk about when you go home to the monastery. For one thing, the monks will think that all I did was read humor magazines while I was gone. For another, after that episode with the car in Indianapolis, the prior might very well ask me to turn in my driver’s license. And I just got a new one a week ago. Some tales are best left untold. And so, out of respect for my confreres, I will not tell them that Detroit and Paris are a lot more alike than they had ever imagined. And I’ll spare the nerves of the prior with my harrowing story of the car of the future. And once again I will heed Saint Benedict’s sage advice. He gave it for just such occasions. +On September 15th I attended the annual meeting of the Friends of the Malta Study Center at the Hill Museum & Manuscript Library at Saint John’s University. 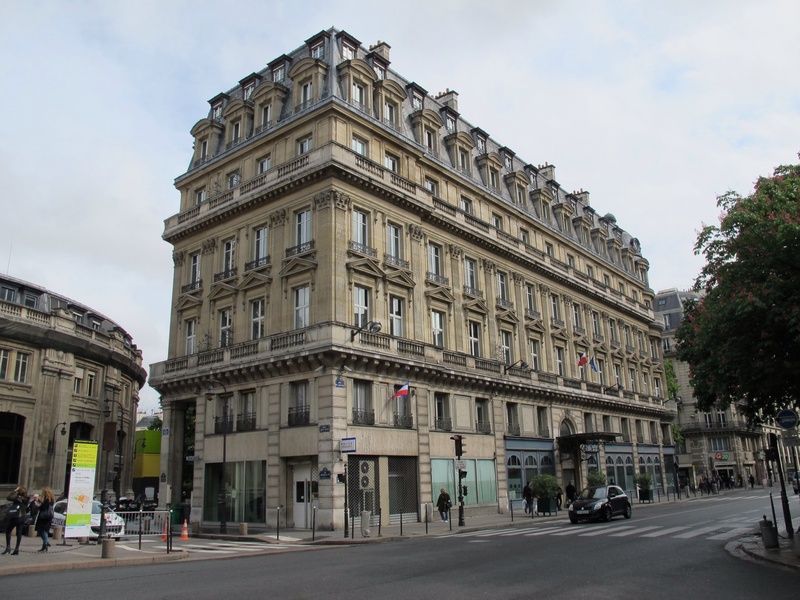 Among the distinguished members of the committee present were Fra Emmanual Rousseau of Paris, Fra Thomas Mulligan of Chicago, and Ambassador Robert Shafer, the Order of Malta’s representative at the United Nations in New York. 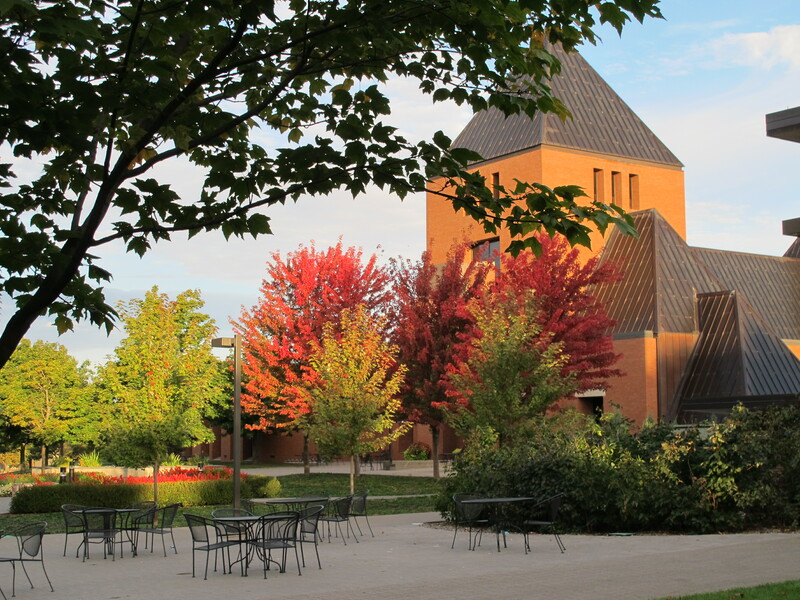 +On September 16th and 17th I gave talks on The Saint John’s Bible at Anderson University in Anderson, IN. 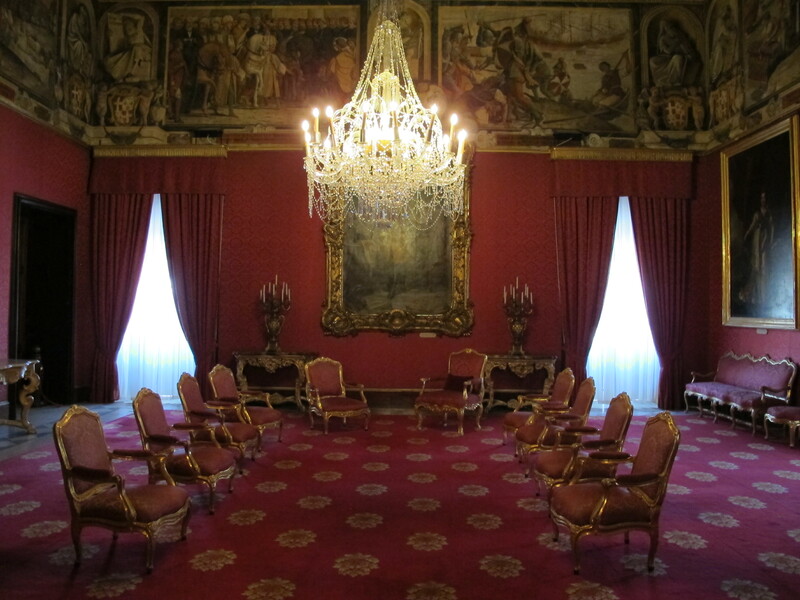 +On September 19th through the 21st I gave a retreat to members of the Federal Association of the Order of Malta. 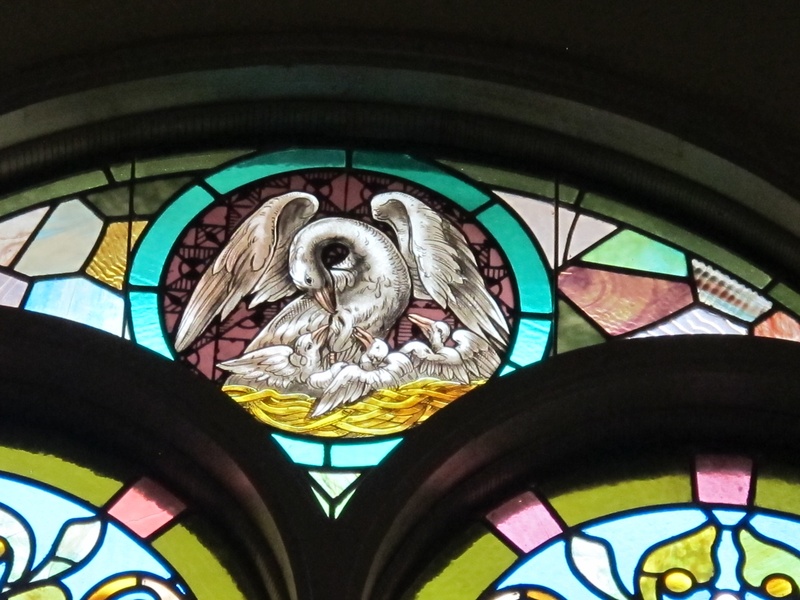 This took place at Cardinal Stritch Retreat Center on the campus of Mundelein Seminary, in suburban Chicago. You can access a copy of my sermon on Sunday, Understanding God’s Ways, in the section marked Presentations. This turned out to be an interesting weekend to be in Chicago, since Cardinal George presented his successor, Bishop Blase Cupick. We adjusted our retreat schedule so we could watch the news conference, which was quite interesting. 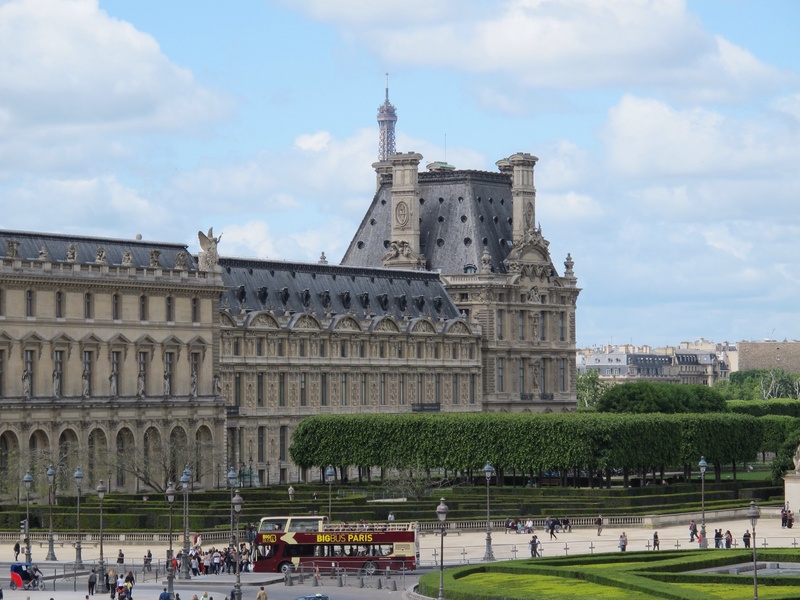 +I took the pictures in today’s post several months ago in Paris. Unfortunately, I do not have a similar batch from Detroit. However, since I’ve read that the two cities are very similar, these should serve for both. 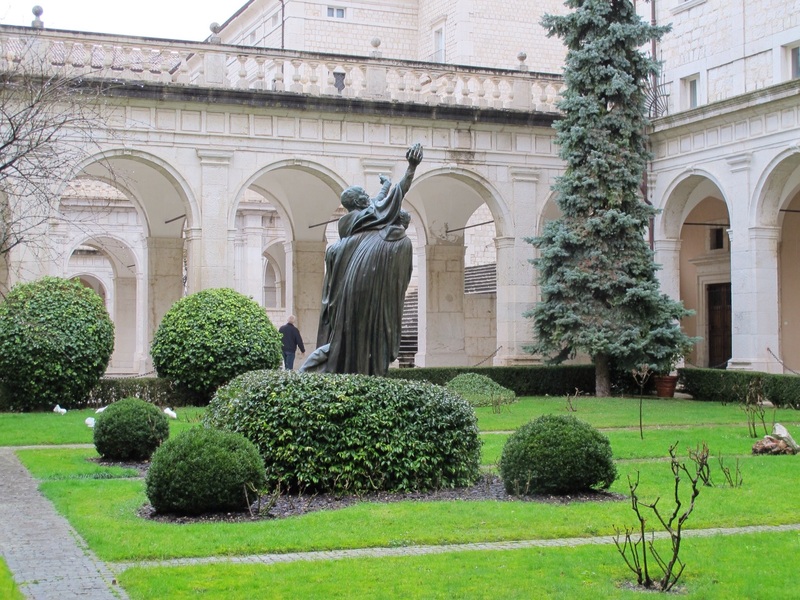 My heart gave out a quiet cheer for the Benedictine monks of Montmajour last week. They hadn’t caught any breaks in ages, so they were long overdue when a bit of recognition finally came their way. 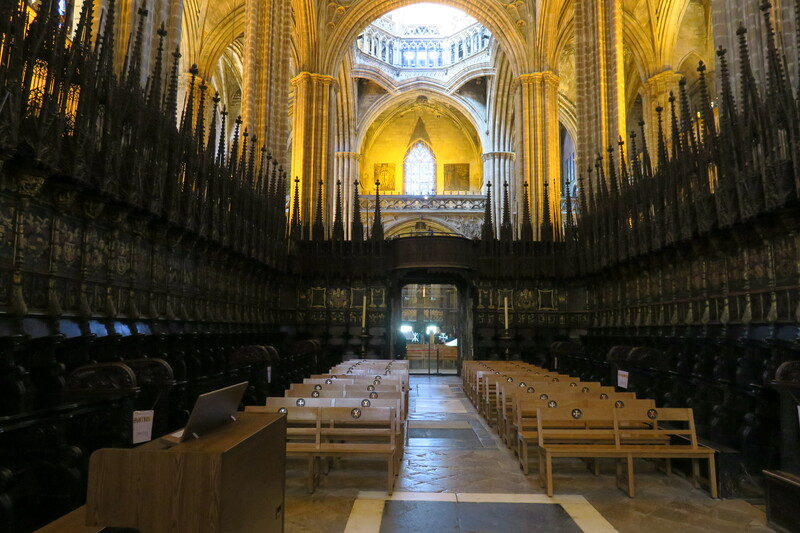 Founded in the 10th century near the southern French town of Arles, the monks occupied a prominent site, and on it they built an impressive complex that dominated the landscape. The centuries were not kind, however, and in later years a succession of non-residential abbots exploited the monks and their property. 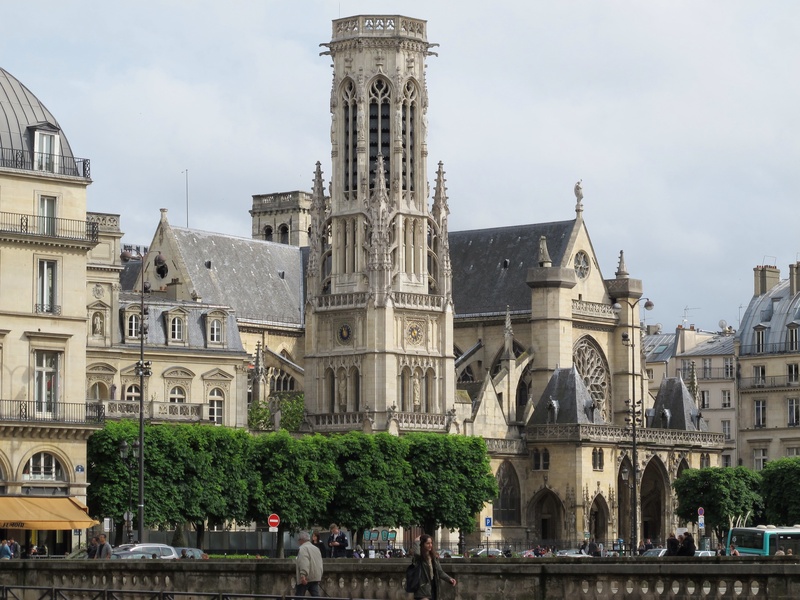 But in 1639 the last of the worst of these abbots, Charles Bichi, lost his iron grip on the revenues and the monastery came under the control of a group of reforming Benedictines from Paris. With a surname like Bichi, and a demeanor that may have matched, you have to wonder why some of the old monks hated to see him go. Maybe they didn’t want to be reformed. 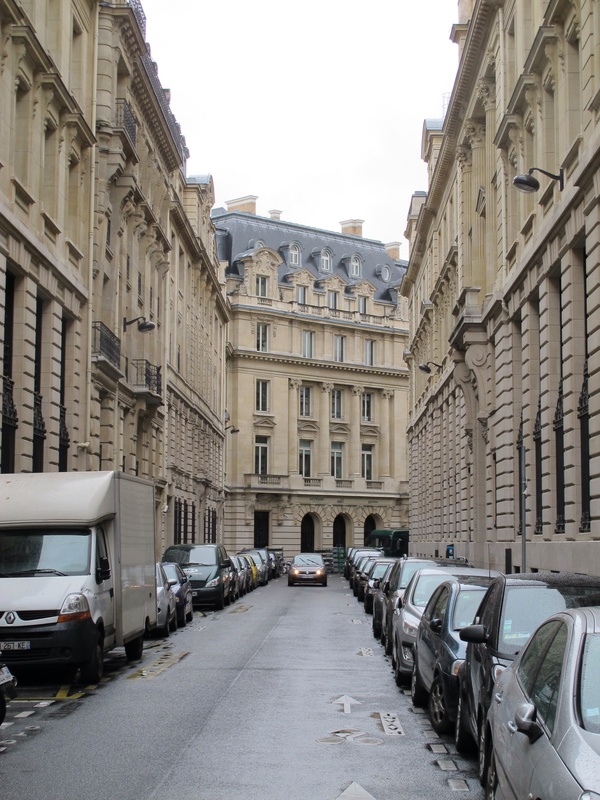 Maybe they thought that an abbot a hundred miles away was better than one just down the hall. Anyway, M. Bichi got his walking papers, and the monks got a relatively tranquil life until the place was secularized in 1786. Then the place went to rack and ruin, literally. And that’s when Vincent Van Gogh enters the story. Van Gogh loved the place, and in one particular painting the abbey of Montmajour figures in the background. Unfortunately, for nearly a century the experts considered this piece to be a fake, and through much of that time it led a rather obscure life in somebody’s attic. It continued to do just that until last week. That’s when a few art historians announced that Van Gogh had indeed painted this canvas after all. It was authentic, and it dated from his years as a mature artist. It was, they concluded, the first such Van Gogh to surface since the 1930’s. Eighty years is no big deal to a medieval historian like me, but it’s an eon in the world of art historians. Not surprisingly, many of them could scarcely contain their excitement, and rivers of hype and superlatives have followed. Naturally, I’m happy for them. And I’m happy for the owner of this painting, who stands to reap a wheel-barrow load of Euros at the cash window. But I’m happiest for the monks. On September 10th the entire community, long-deceased and for the most part resident in heaven, got to see their monastery cited on page one of the Arts Section of The New York Times. They also got an honorable mention in The Wall Street Journal. Their work has not been in vain, and it had to be gratifying to them. Despite the Cinderella slant to this story, there’s something that unsettles me just a bit. For fans of The Antiques Road Show, this is the mega-jackpot, of course. We’ve all dreamed of dragging our aunt’s old teapot out of the attic, only to have it appraised at $10,000. And who hasn’t fantasized about the true value of those old, in-mint-condition magazines stacked in the basement? But a forgotten painting in the attic that could fetch $50 million at auction? I don’t know about you, but that sounds like no attic I’ve ever been in. This is not your average attic, and you have to wonder what other auction-monsters the owner will drag out in the years to come. Still more troubling is the sudden reversal of fortune for this painting. One day it is a useless piece of junk, good for nothing save collecting dust. The next day it is worth untold millions. What changed here? Certainly it was not the painting itself. Either it was as lovely on Tuesday as it was on Wednesday, or it wasn’t. This was definitely not a case of an ugly duckling evolving into a graceful swan in the course of a few hours. There’s only one thing on which I can pin any change in character, and it’s this. It was the same painting before and after; but on one day it was a worthless forgery, and the next it was a $50 million Van Gogh. It’s as simple as a change of label. The subject may be anything from a landfill to a stray dog or a pick-up truck at a stop sign. But if it is a $50 million Van Gogh painting of a truck at a stop sign, it is breathtakingly beautiful. I don’t mean to sound cynical here, but how else do you explain this? People could care less about a nondescript painting stored in the attic. But we will line up for twenty minutes and more to see a painting with a famous name on it. The fact is, we adore celebrities, and we love items with big price tags on them. And I suppose it’s also safe to conclude that anything expensive must also be beautiful. Deep down I’m glad that the experts declared this to be an authentic Van Gogh. I’m delighted too for the owners and their lawyers, who no doubt watched from the sidelines with detached curiosity. I’m sure all were driven by their altruistic love of art in their quest to solve the mystery of this painting. Conversely, I’m not at all surprised by the alacrity of the media in picking up on this story. It’s a good tale, and one that piques the imagination. But while it answers the question of authenticity on one level, it raises it on another. For better and for worse, trend-setters do exactly that: they help us decide what we like, even before we know what it is we would like to like. It’s peer pressure and social convention that encourage us to ignore the beautiful fake in the attic, while we flock to see the famous mediocrity in the gallery. Too often we let others decide for us, when we should be making those judgments for ourselves. That strikes me as the moral to take from all this. As people who aspire to be mature human beings, we must be the ones who decide what we like and dislike, and we ought not cede that to some expert. If something or someone is beautiful, they will be beautiful no matter what price tag the appraiser sticks on it. And if something means a lot to us, we need to cherish it now, rather than wait for an expert to tell us when it’s cool to do so. This too is a form of authenticity, and we are being authentic when we make decisions for ourselves. At the end of the episode the owners of the new Van Gogh come out way ahead. Their lawyers come out way ahead. And perhaps a few art historians get a big boost to their careers. As for Van Gogh, he doesn’t get a penny from the upgraded sale price. With a well-established reputation, he scarcely needs the additional fame. But perhaps he gets some amusement from all this, because the whole thing has confirmed his appreciation of human nature once again. But it’s the monks of Montmajour who must be pleased as punch. They went to Montmajour to seek God and not celebrity. But even a small appearance in The New York Times and The Wall Street Journal has to be savored. And they can take solace in knowing that a few people have enjoyed a peek into the ruins of their monastery. But most of all, I hope they take pleasure in knowing that they’ve struck the spiritual imagination of at least somebody out there. If even one person joins them in the spiritual quest for authenticity, then those monks continue to fulfill their mission. 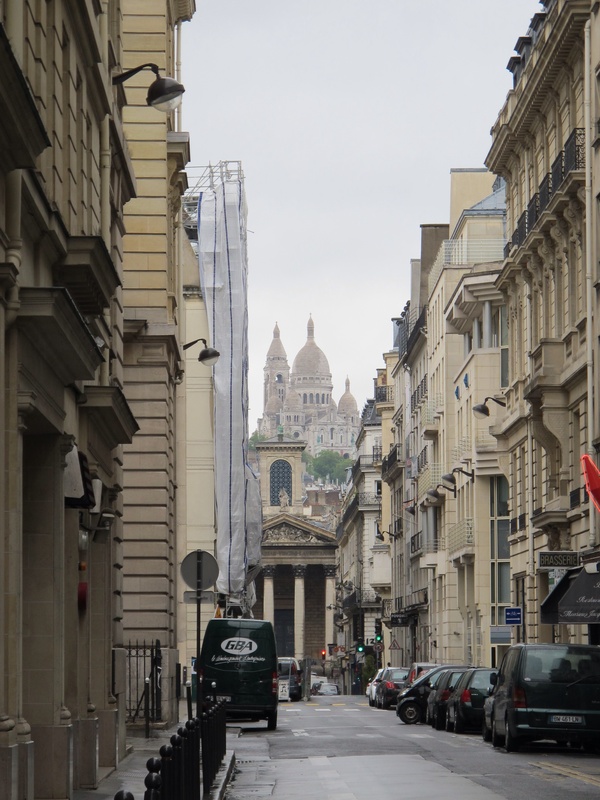 +Recently I took the opportunity to visit our confrere, Fr. Edward Vebelun, OSB, who in July became pastor at Saints Peter and Paul Church in Richmond, MN. 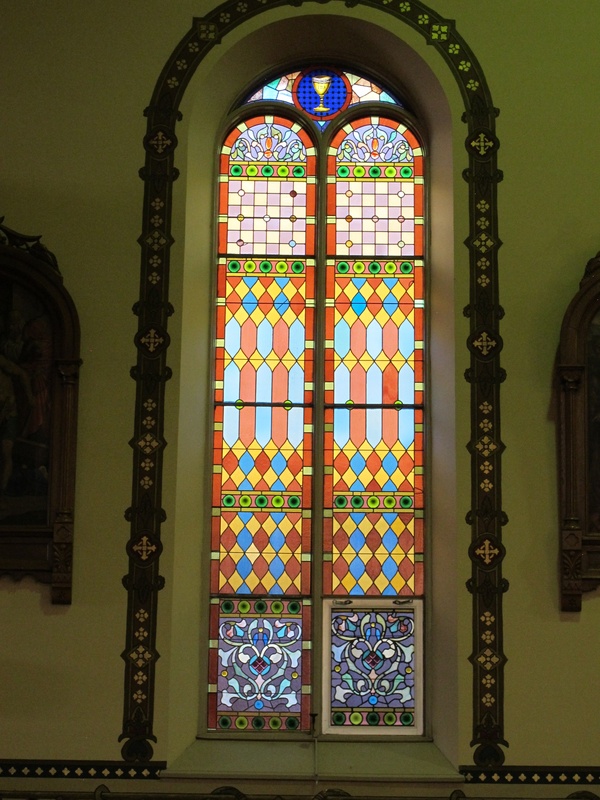 The parish is just a few miles from Saint John’s, and monks have served as pastors there since 1856. 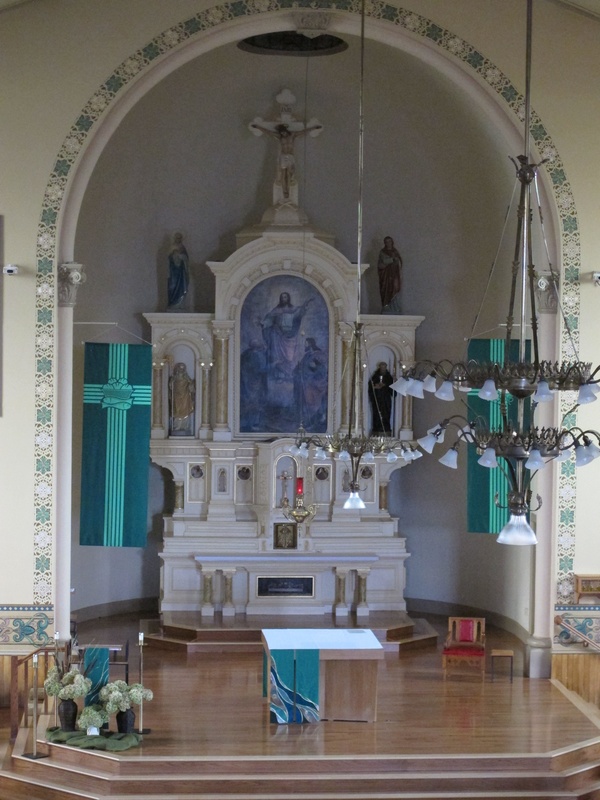 It’s a lovely church, and the statue of Saint Benedict on the main altar shows the Benedictine connection clearly. 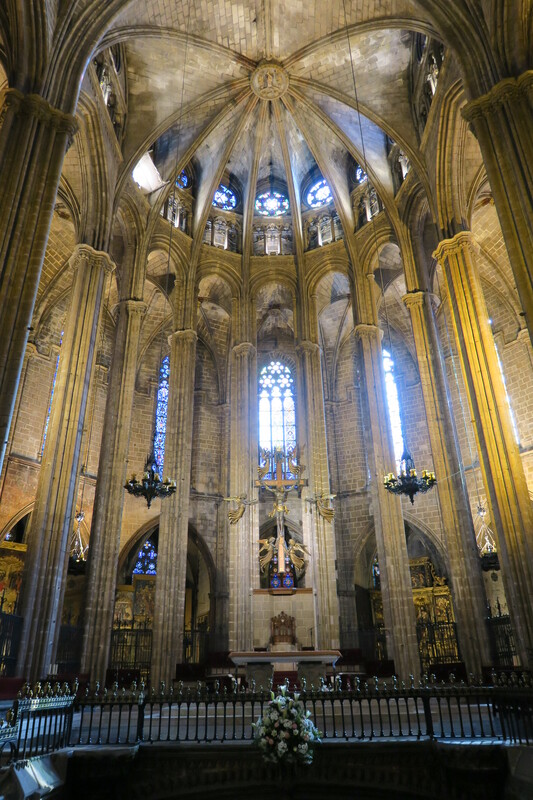 It is noted for its huge German-style stations of the cross, as well as for the paintings that grace the ceiling of the church. The cycle of paintings include both men and women, saints and biblical figures. 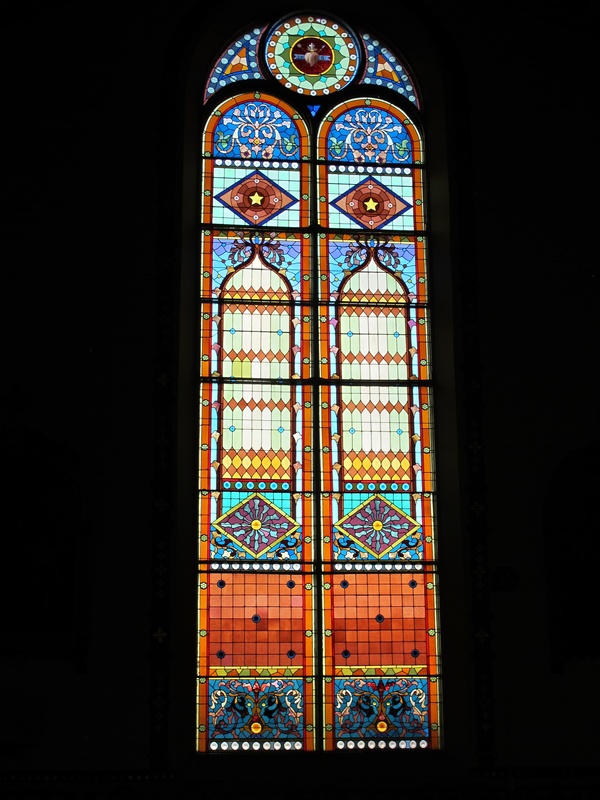 But it is the stained glass which I find stunning. 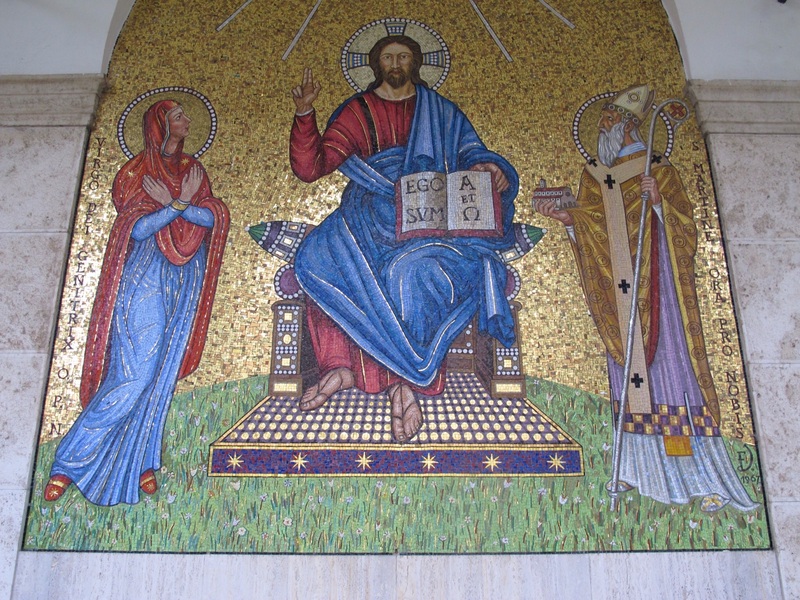 The pictures in today’s post all come from Saints Peter and Paul Church. +On September 9th I attended the annual meeting of the Friends of the Malta Study Center at the Hill Museum & Manuscript Library at Saint John’s. We were joined by three new members, including Fra Emmanuel Rousseau, KJ, of Paris; Fra Thomas Mulligan, KJ, of Chicago, and Mr. Michael Grace, a member of the Order of Malta from Pasadena, CA. 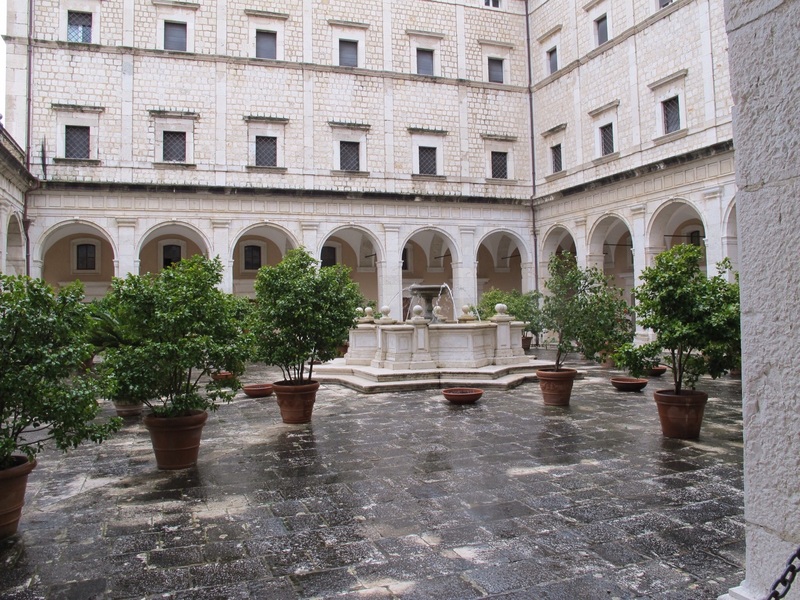 Currently the Center assists in archival preservation projects in Malta as well as at the archives of the Grand Magistry of the Order of Malta in Rome. 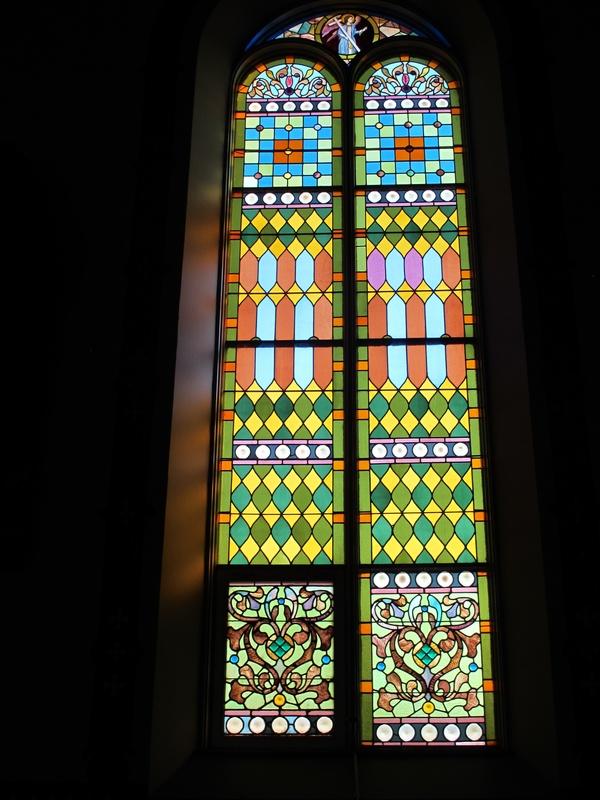 +On September 14-15th I made a brief trip to Seattle, where I gave talks on The Saint John’s Bible at Epiphany Episcopal Church. 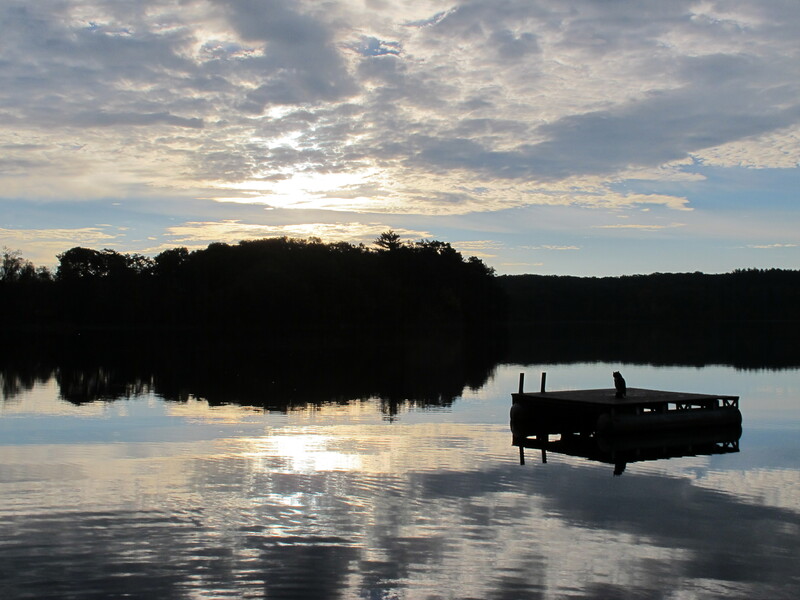 This past week we were on our annual retreat at Saint John’s Abbey, and our director was Fr. Timothy Radcliffe, OP. Fr. Timothy was for many years the Master of the Dominicans, and he currently serves as the Master of Blackfriars at Oxford. Of even greater import for our purposes, Fr. 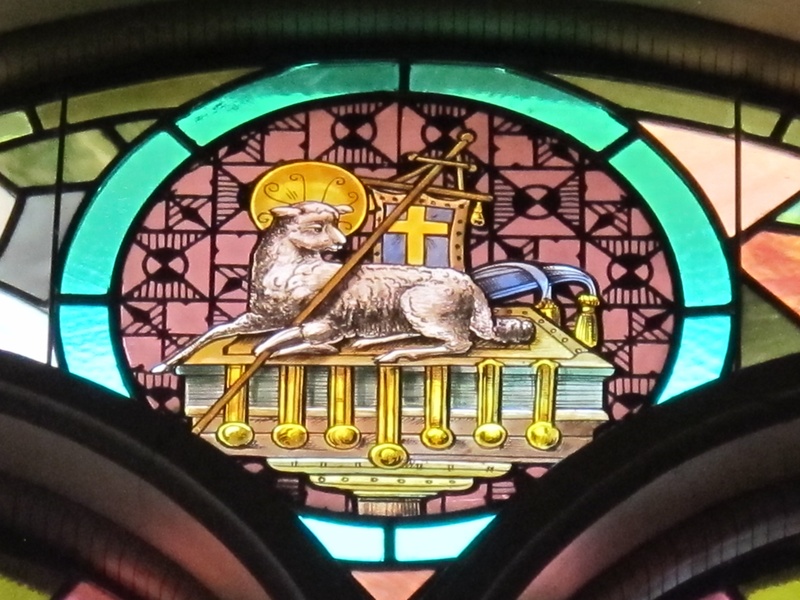 Timothy is an eloquent preacher and prolific writer, which one would hope to find in a member of the Order of Preachers. Even better, he speaks in a lovely English accent, which should surprise no one, since he’s from England after all. I say “even better” because long ago we monks discovered what suckers we are when it comes to foreign accents. For one thing, people with foreign accents sound so much smarter than we, since by implication they know two or more languages. That’s at least one more than most of us speak. And if an English accent doesn’t necessarily imply two languages, at least it suggests a level of worldly sophistication that many of us envy. All things being equal, we’ll sit and listen to an English accent without complaining for hours on end. Not so the American accent. After all, what could an American monk possibly tell us that we don’t already know? No doubt Fr. Timothy’s experience, learning and wisdom all contributed to the success of his conferences. But he also likes to season them with stories. So plentiful and so charming were his stories, that many of us were swept up by them and often forgot the point of a particular conference. We forgot, that is, until he reeled us back near the end of each talk. Then, all of a sudden, we’d see the carefully-cut path through the trees and behold the magnificent forest laid out before us. Like any good parable, the story of the cheese sandwich is capable of many applications. But I’ll start with the monastic life, because it’s what I know best. We world-weary monks are accustomed to seeing novices come to the monastery with all the excitement in the world. For them it’s a heady time, and on the day they are clothed in the habit the intensity of the spiritual life is especially acute. The future is incredibly promising, and what we call “first fervor” seems to be both boundless and endless. But it’s neither, as we all know. Sooner or later reality sets in, and all of us begin to notice the little failings in the people around us. It’s never easy coming to terms with people whom you realize are prone to lots of mistakes and even a few sins. But you have to reconcile yourself with them, somehow. It’s doesn’t mean that we lower our expectations of one another. Rather, it is a process of identification with our brothers. They are fallible. But so are we. And once we admit that we are on a pilgrimage to God, together, then it’s easier to accept our common lot. As brothers we strive to do our best, and we have to help each other along the way. That’s the reality that blossoms when the innocence of first fervor peters out. But a few never make it. There comes a day when life in the monastery makes no sense. In the face of the human, nothing seems to matter any longer. The spiritual quest that brought us to the monastery begins to seem pointless. It’s scarcely worth the effort to get out of bed or show up for anything. This surrender is what John Cassian and others have called acedia. It’s the noon-day devil, the terror of the night, in which life in the monastery — and perhaps life itself — seems pointless. It’s devoid of any and all meaning. That “dark night of the soul” has also gripped the likes of Mother Theresa and Theresa of Avila, as well as a host of lesser lights. That number may even have included us as well. For a while, or for a long time, the God whom we thought was there seems absent. And then we wonder if God has abandoned us — as Jesus did on the cross. And more desperately, we question whether there even is a God. Such is the scourge of the noon-day devil. That experience is not isolated to our relationship with God, nor is it found exclusively in monasteries. It happens to people in parish churches; and it happens within marriages and friendships. I presume, for example, that people marry for the best intentions in the world; and they do so in the full flower of love. Then something happens, and the life drains out of the relationship. The other person seems distant and alien, and it’s easy to believe that there was never any love there from day one. Worse still, there’s no hope of repairing the relationship. So why even try? But the parable of the cheese sandwich suggests that our fundamental assumptions can sometimes be wrong. What if our downward spiral is not someone else’s fault? What if God is not the one who moved away? What if it was not our spouse who did the changing? What if it was not our friend who was the one who grew cold and indifferent? Does it ever occur to us that perhaps it was we who did the changing and the drifting? At what point did we become so negative? Could it be that we were the ones who blinded ourselves to the beauty of life? There’s no easy cure for acedia. Waiting is part of the therapy, as is opening our eyes. “Listen” is the first word of the Rule of Saint Benedict, and I think that too is a key ingredient. Common to all is an openness to see God alive and working in our world, as well as in the people who mean so much to us. Very often this means stretching ourselves to see God and others in new ways. And it can mean seeing them as they are, rather than as we would like them to be. As for the guy who made the cheese sandwiches, I give thanks to God that I am not like him. I definitely would have made the cheese sandwiches, all right. But on Monday it would have been brie; on Tuesday gouda; on Wednesday cheddar; and on Thursday Stilton. I’d let Friday be a surprise. +Last week I hosted two individuals for private retreats at Saint John’s. Fra Jeffrey Littell made a three-day retreat in preparation for the renewal of his temporary vows as a Knight of Justice in the Order of Malta. Fra Jeffrey is from Orange County, CA, and is a member of the Subpriory of Our Lady of Philermo, to which I am a chaplain. Mr. Stephen Klimczuk is from Santa Fe, NM, and a member of the Federal Association of the Order of Malta. His five-day retreat began his year of preparation to become a Knight in Obedience in the Subpriory of Our Lady of Lourdes. +Last week friends of the Hill Museum & Manuscript Library at Saint John’s University embarked on a tour to Malta. The Knights came from Rhodes to Malta in 1530, and remained there until Napoleon conquered the island in 1798. 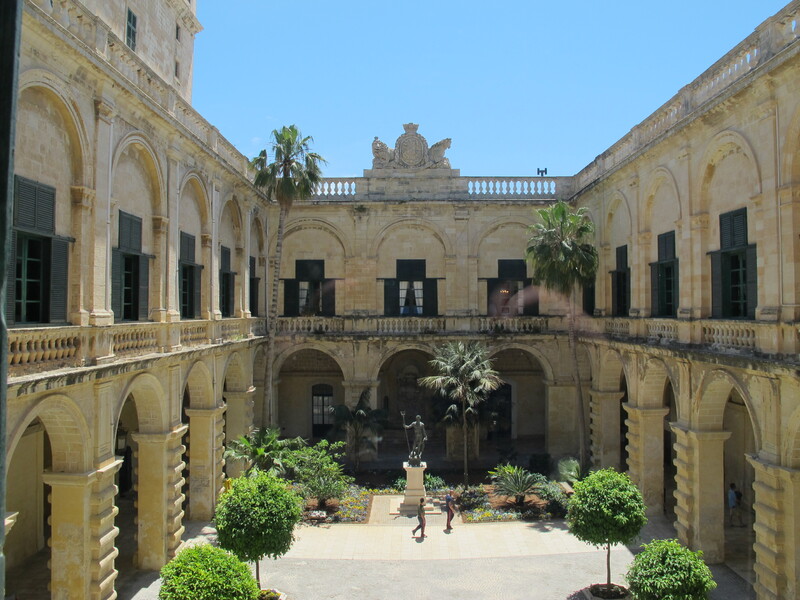 The buildings left behind by the Knights are impressive, and include the Grand Master’s Palace, which serves today as the seat of government of the nation of Malta. But the spiritual heart of their presence in Malta remains the hospital, whose enormous wards housed hundreds of patients. The Knights served the patients as “Our Lords the Sick and the Poor,” and in that spirit served their patients’ food and medication on silver plates. Since they saw Christ in all the sick and the poor, the hospital served people of all religions, be they Christian, Muslim or Jew. The pictures in today’s post come from Valletta, the capital that the Knights built. 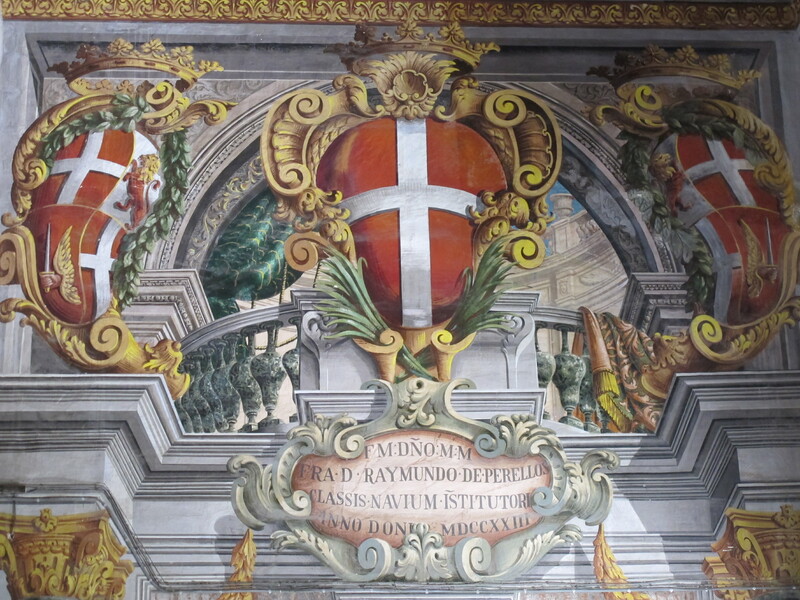 For forty years the Malta Study Center at HMML has worked to preserve the archives of the Order of Malta, housed at the National Library of Malta.